Apparently, the four main girl characters (Ana Ming, Julia, Kohanna and Veronica) all have magical moonstone necklaces. There are no details about what the moonstone necklaces can do, though. Julia closed her hand around the moonstone. The pendant heated in her palm and through her fingers, bright purple light shone in dazzling beams. The sounds of horses trotting, wagons rolling over cobblestone roads, and the chiming clash of steel on steel echoed throughout the room. She opened her palm and stared at the moonstone, squinting from its light. 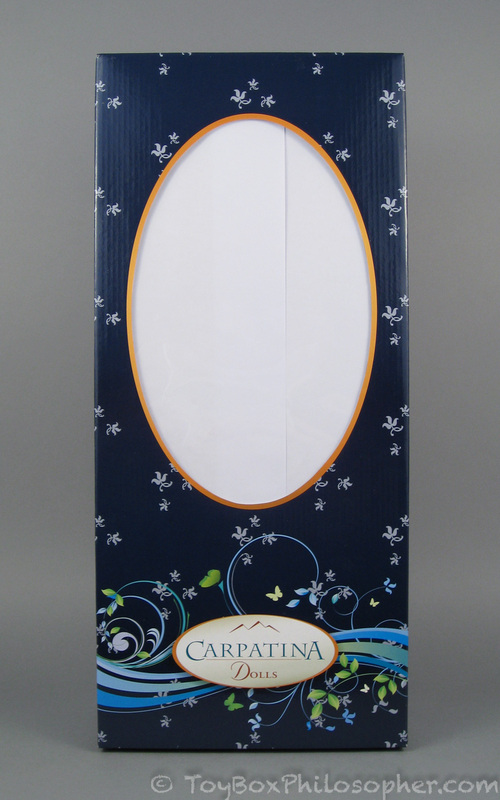 The gem became like a spectral mirror, wavering like the trembling waters of a crystal pond (Carpetina.com). 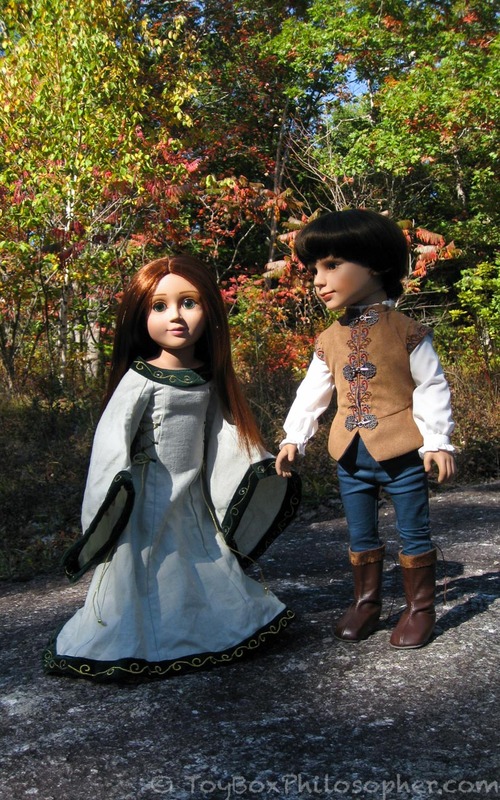 My guess is that the necklaces allow time travel--hence all of the gorgeous historical costumes in the Carpatina Fantasy Adventures collection. The best part about the back of Stephan's box is that it has photographs of the other Carpatina dolls. In particular, it's great to have some pictures of the older boy characters for comparison. That head is SO BIG. The back of the box also has pictures of most of the girl characters (the fancier doll with Erin's face--Rowena--is missing). Her coloring is a little extreme for me. 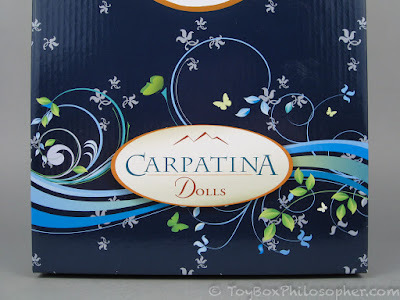 If I bought another Carpatina doll now, it would probably be Kohanna. Her eyes look smaller than Erin's massive orbs, and she has lovely, natural face paint. 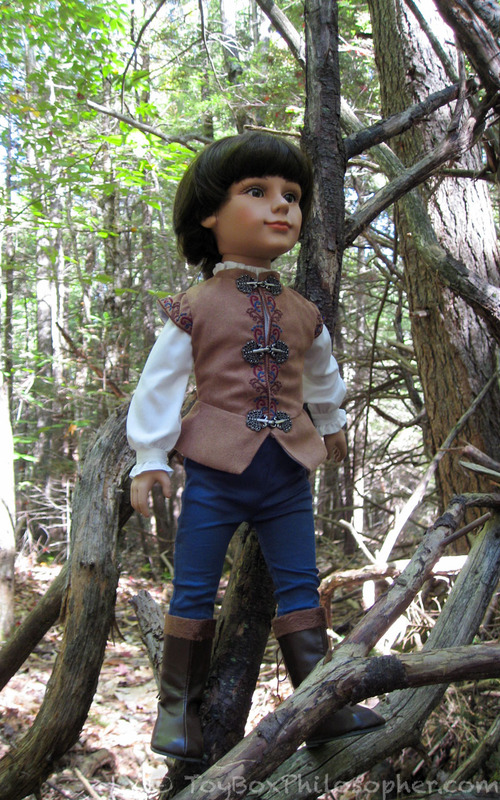 He stands up very well on his own and looks great in his medieval outfit. Stephan's hair is even longer in the back than it looks in these pictures. The curl at the end hides a lot of extra length. 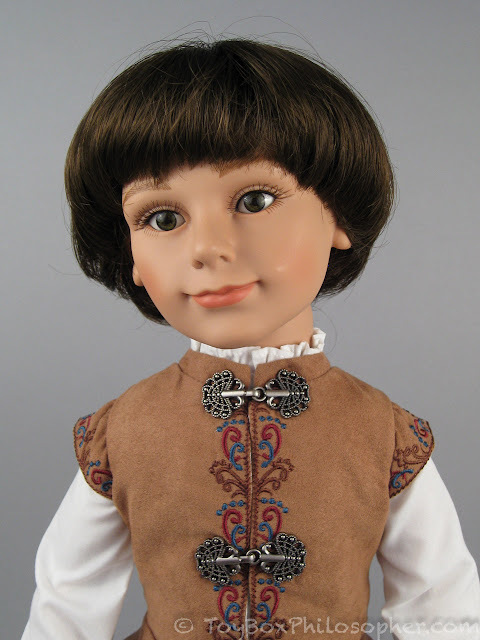 The pageboy hairstyle is thought to originate from medieval bowl cuts, but these tend to be associated with servants--or page boys. I don't know. 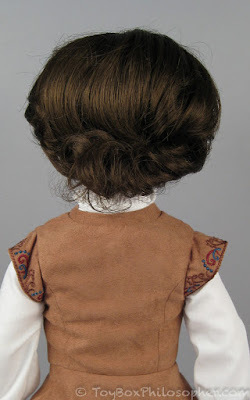 I'm way out of my depth here, so I'll assume that the good people at Carpatina knew what they were doing with this hair. For anyone who does not like the style, there's plenty of hair in the wig and it could probably be trimmed into a more modern style. 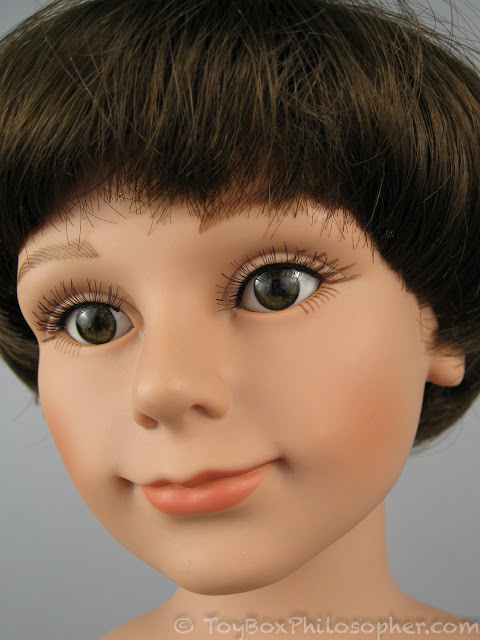 Re-wigging is also an option. Stephan's eyes are nicely scaled to his head and have a natural shape. They look brown from a distance, but are actually a complex mossy green color. Stephan has applied upper eyelashes, but he also has light brown painted lashes at the outside edges of his eyes. This looks a little funny to me. I think it would be better if just the lower lashes were painted...and if they matched the color of the applied lashes. You can see how long the hair is in this picture! 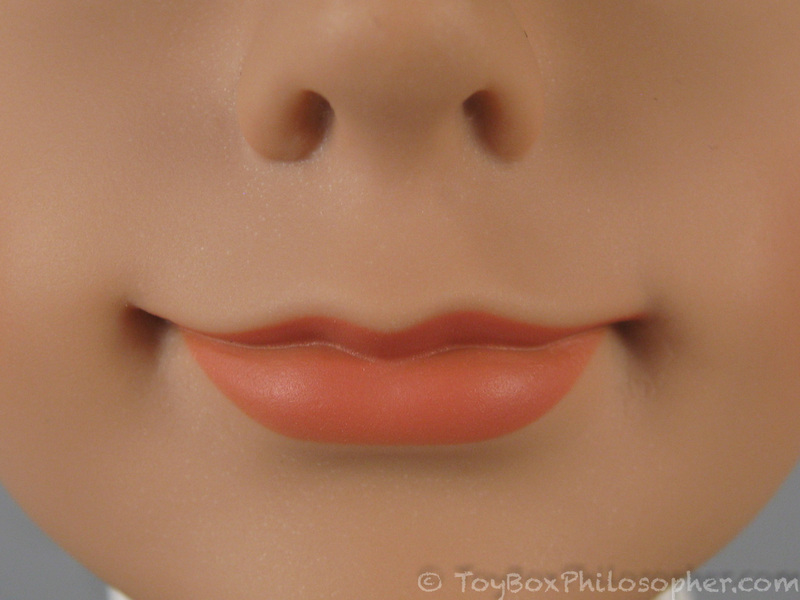 The lips are painted a pale orange-pink color that looks reasonably natural. 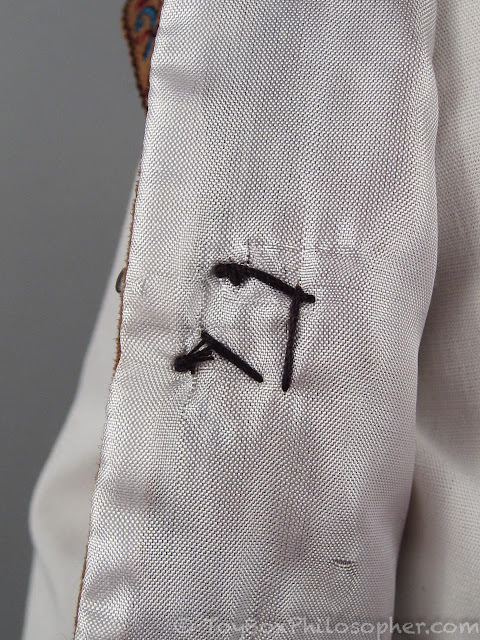 The other Carpatina boys come wearing everyday clothes. Adam is wearing a dress shirt and jeans, and Carter is wearing a polo shirt with jeans. Stephan, however, is wearing a gorgeous historical outfit. 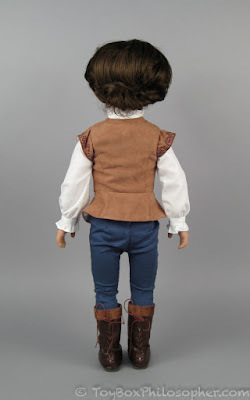 This outfit made him even more appealing to me because I knew it would go nicely with the Guinevere dress that I reviewed with Erin. 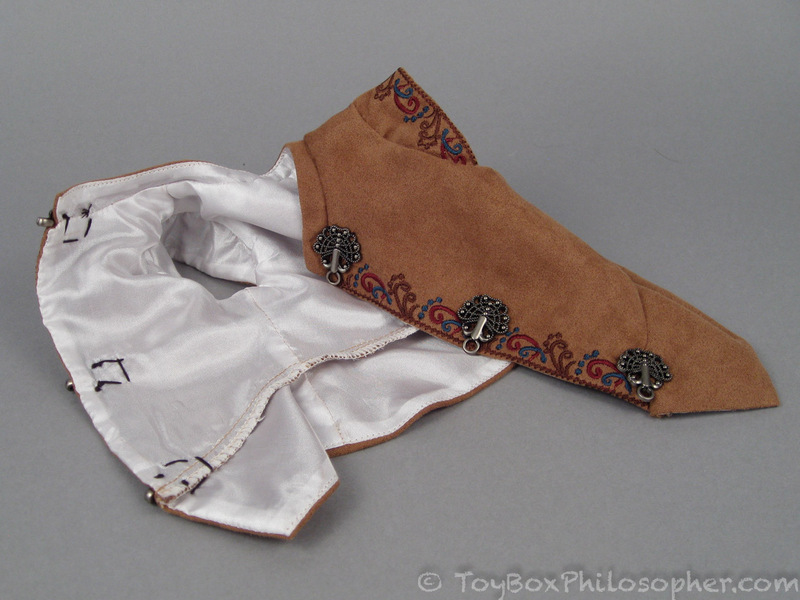 The doublet is fully lined and beautifully made. 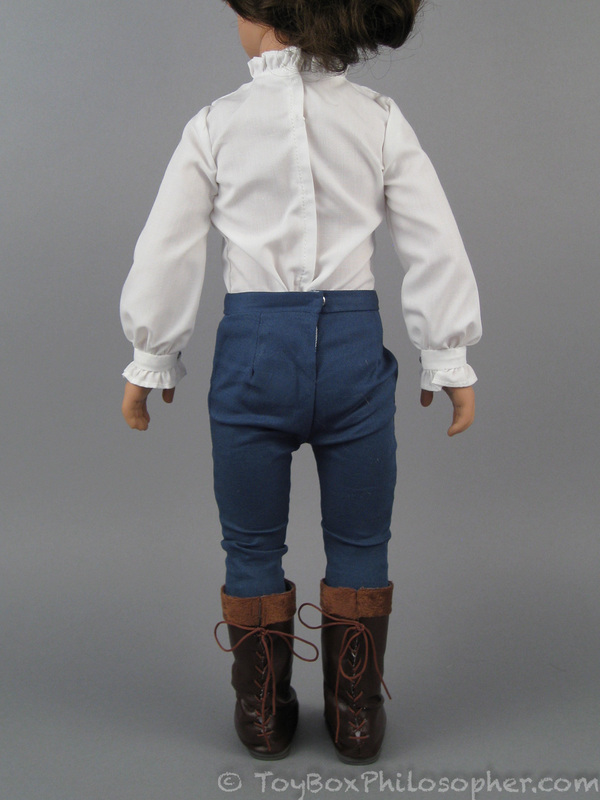 Stephan's blue pants are tight-fitting, with no embellishments. They're almost like tights in their appearance, but they have far more tailoring. Do you see that lace about to disappear through the hole at the top? Ah!!! Can you imagine what a pain it would be to get a lace re-strung if it came out? The holes are tiny and they're not reinforced with anything. 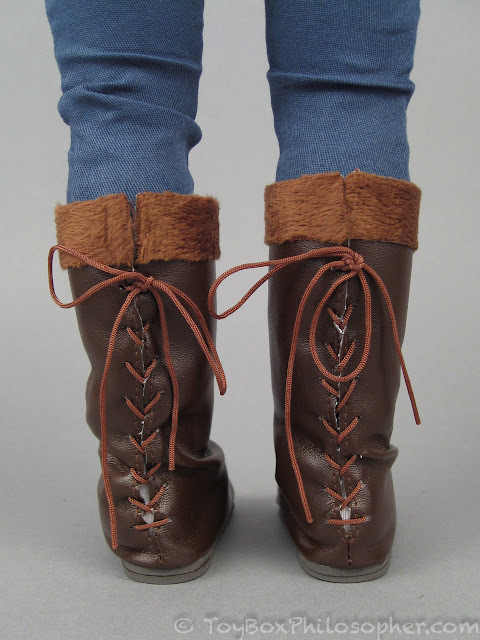 Other than the irritating laces, the boots are great. 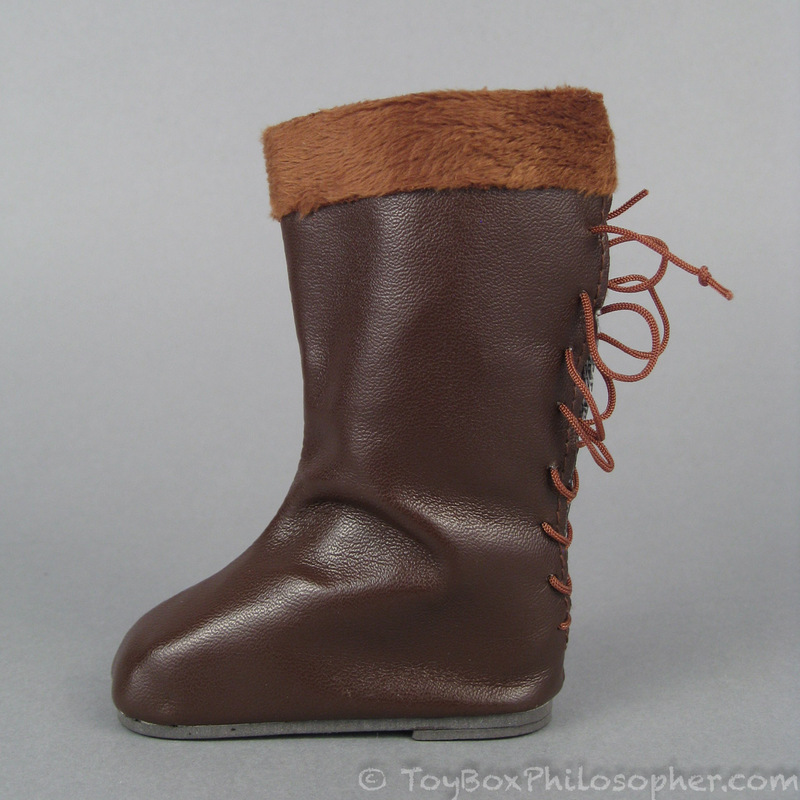 They're made out of chocolate brown imitation leather and have a fur band on the top. While I was wrestling with Stephan's boot, he was laying face-down on my table. 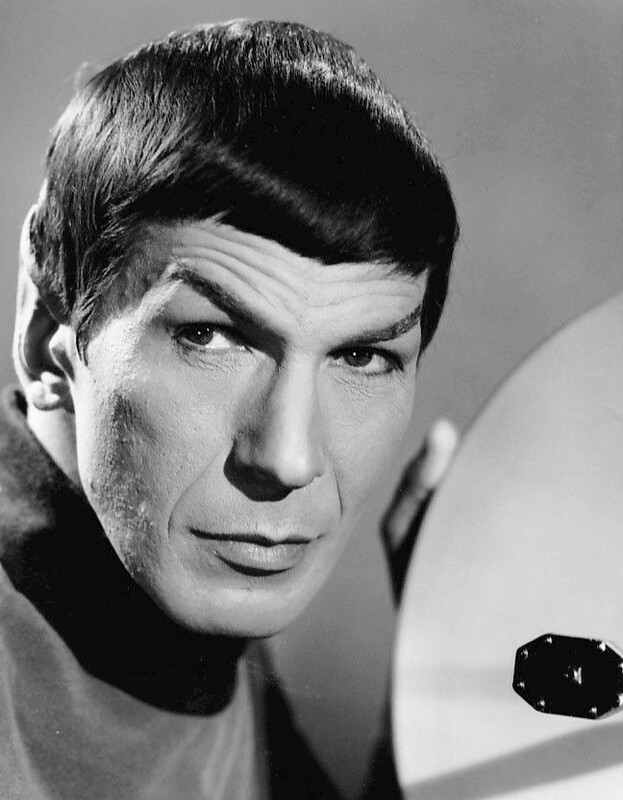 I was sad to see that this caused two shiny spots to form on his face--one on his left cheek and one on the tip of his nose. I guess I have to be more careful. It takes a little maneuvering to get the tight pants off over Stephan's feet. This might be a challenge for younger kids...but then again, anyone who can remove the boots can probably do anything. I wonder if this is a one-time molding defect? It's barely visible in the pictures, above, but Stephan also has more pronounced knee caps than Erin. Both of my Carpatina dolls are strung with elastic. Stephan is tightly strung and so he holds poses nicely. He can move his head in any direction, but has a harder time tilting it to the left than he does to the right. Brief tangent about handshakes: I was told that the handshake actually originated in medieval times because it was a way to greet someone while also showing that you were not going to stab them. Because you can't use your hand in a greeting while also using it to grab your sword. Fun fact. Stephan's hips are strung, but the fit of the joint is such that they pretty much only spin around as though they had peg-and-hole articulation. 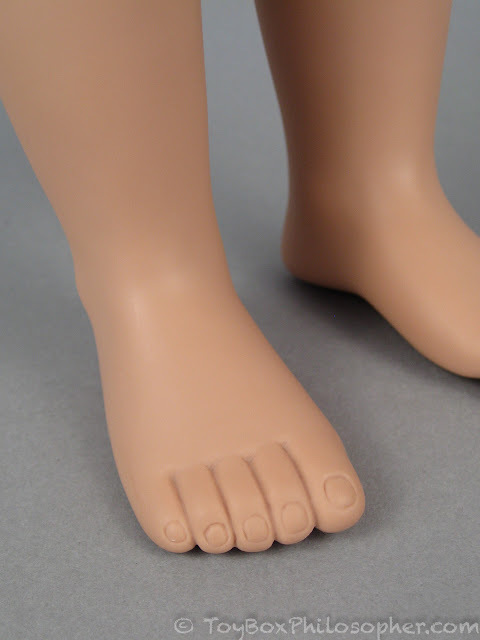 The legs do move from side to side a little bit when they're positioned straight up and down. 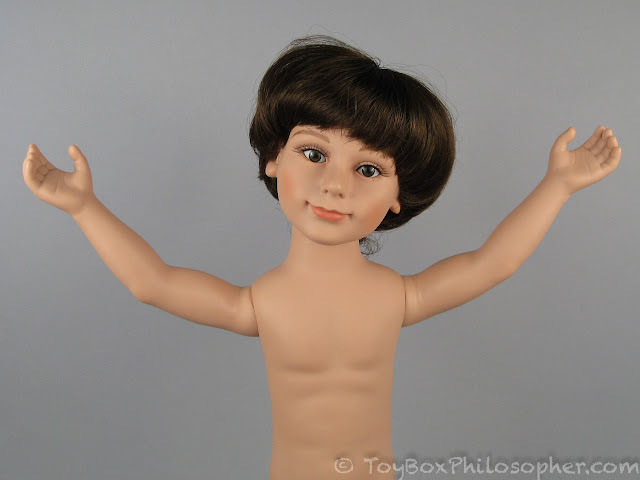 I do not own any other 18-inch boy dolls, so there were no clothes-sharing possibilities for this review. 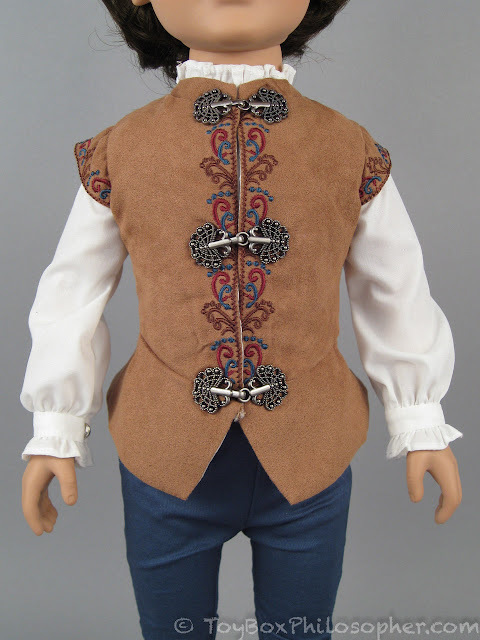 I'm curious to know whether or not the wonderful Kidz 'n' Cats clothing will fit Stephan, though. 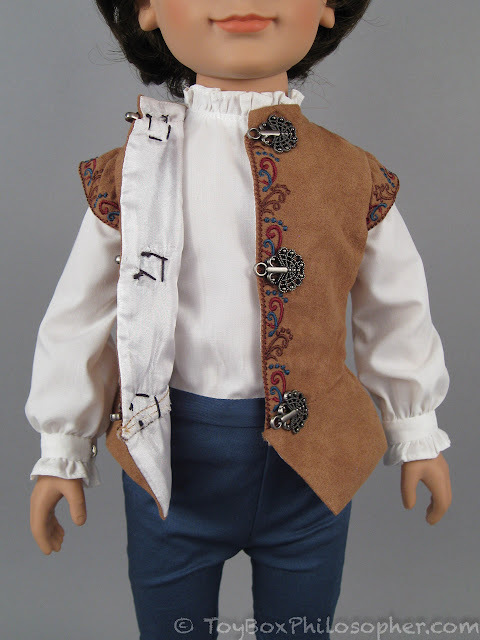 The Carpatina boy clothes all look like outfits for adults, so the Kidz 'n' Cats wardrobe would be a nice way to bring out Stephan's youthful personality. 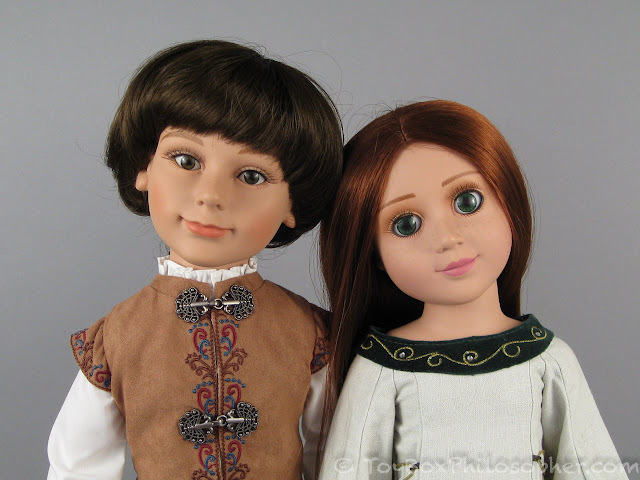 ...my only issue is that Erin's eye size and shape looks so doll-like compared to Stephan's more realistic eyes. 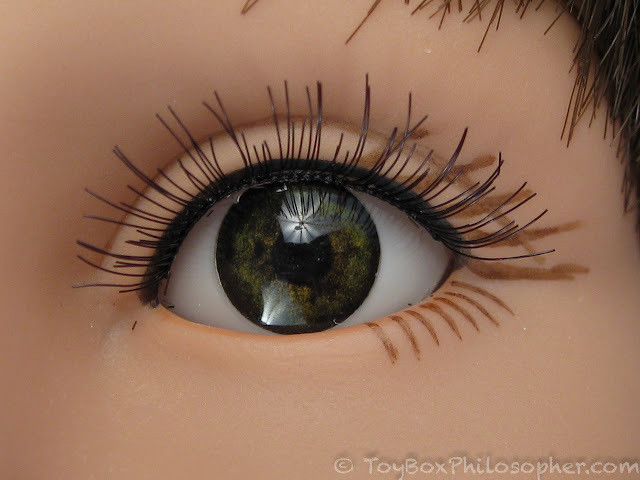 I wonder why this company gives their female dolls such cartoon-like eyes? Erin's eyes open and close while Stephan's do not, so perhaps that mechanism limits the possible eye shapes. A Girl for All Time's Clementine and Carpatina's Stephan. 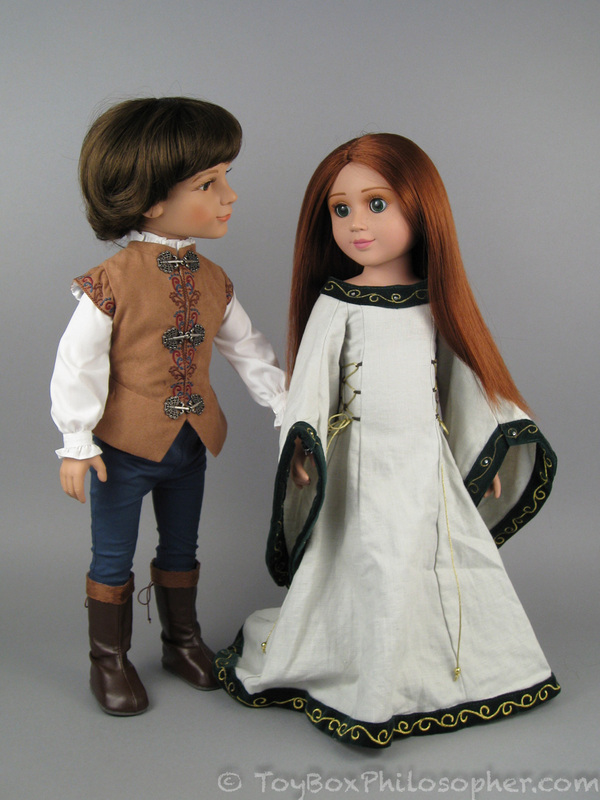 The Guinevere dress is big on Clem, but she still looks very nice with Stephan. He makes her look a bit less realistic, though. It's all about those eyes. 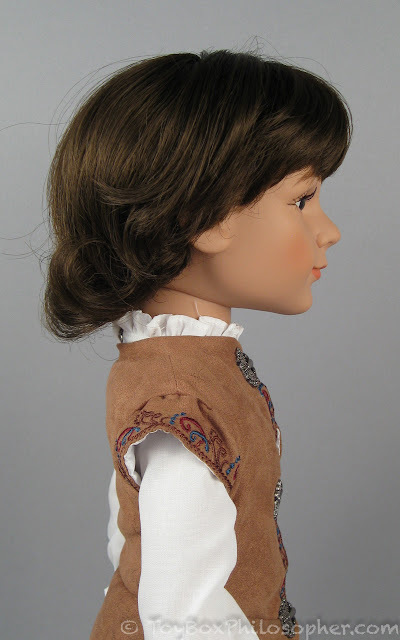 I would love to see Stephan with the more period-appropriate Matilda! She's next on my list. Carpatina's Stephan and Kidz 'n' Cats Evita. 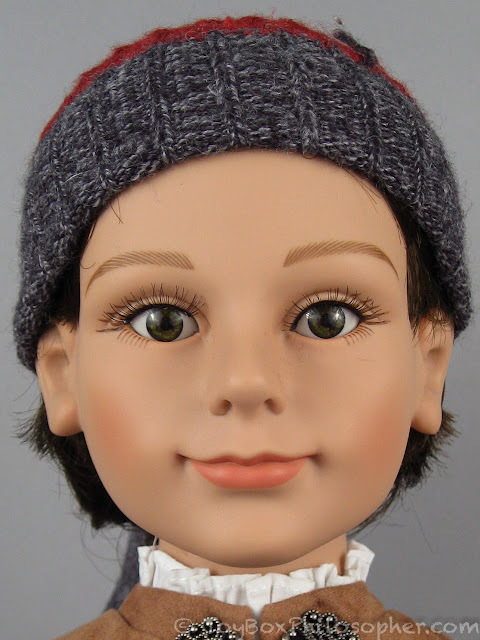 Evie has a younger face than some other Kidz 'n' Cats dolls. 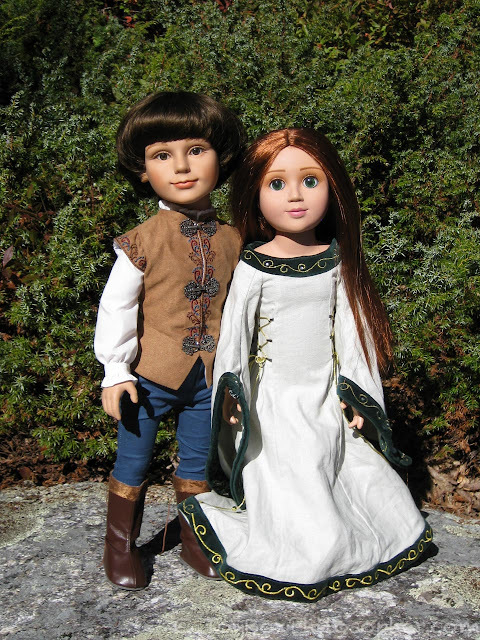 I think another character (like my niece's Grace, for example) would look even better with Stephan. 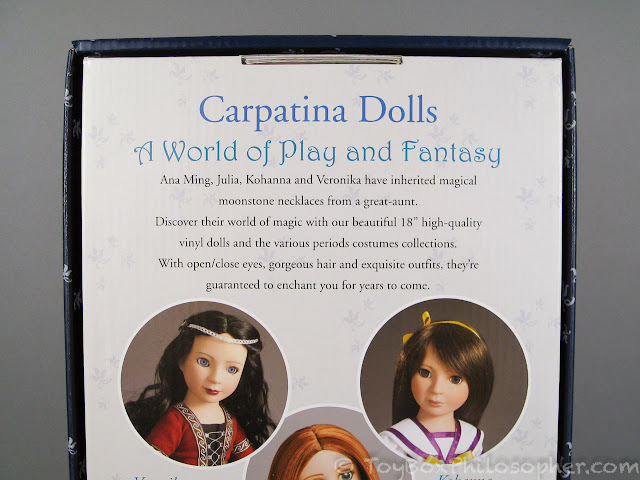 My Salon Doll Sydni and Carpatina Stephan. Carpatina Stephan and Maplelea Saila. 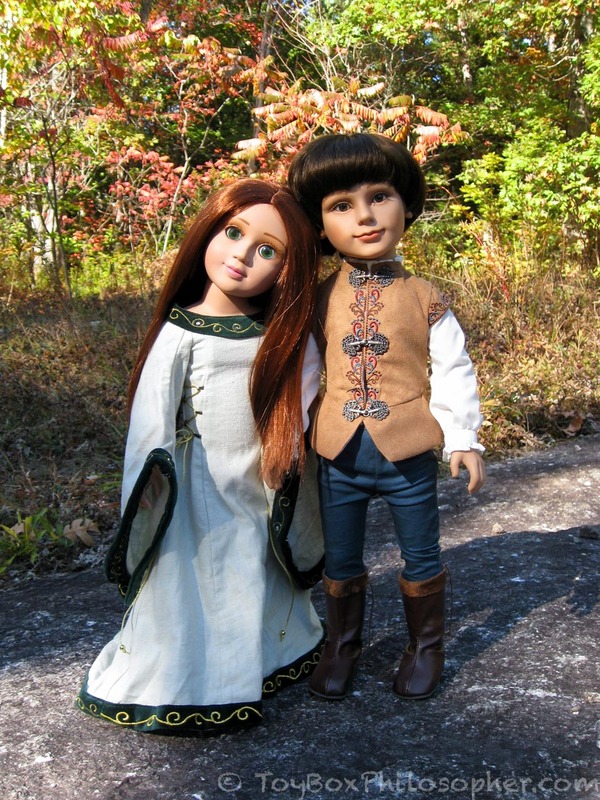 Saila's head is larger than Stephan's, but they're about the same height. 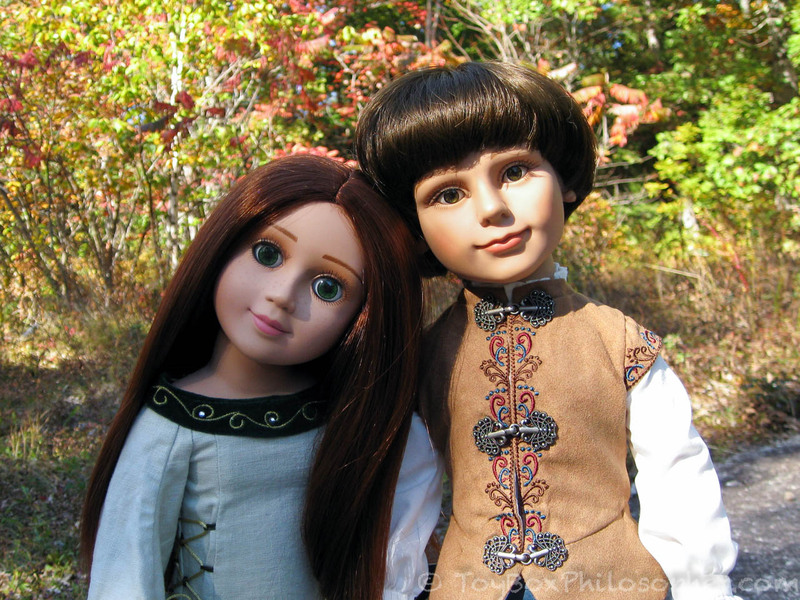 I wanted to keep Erin and Stephan together for this review, though, because other than the eye differences, these two are a great pair. 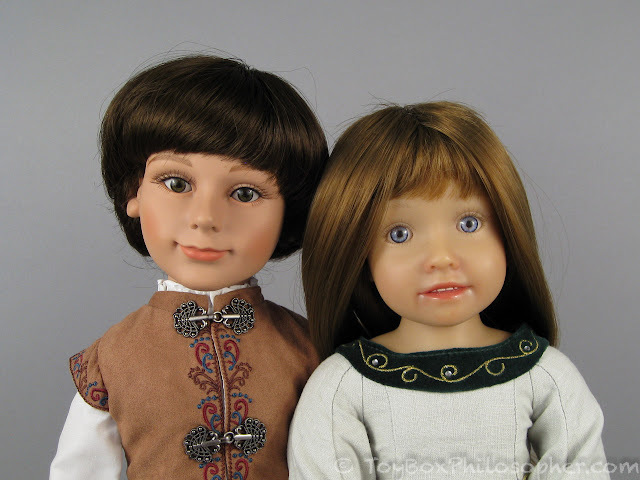 Both dolls have kanekalon wigs, but Erin's hair feels much silkier than Stephan's. 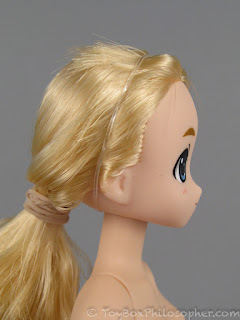 On the other hand, Erin's wig has a ton of shorter strands that stick out while Stephan's wig is more uniform. I thought these two would look great in a magical forest setting, so I took off into the woods near my house to see if I could get some good pictures. We've had another warm spell here in Maine these past few weeks, so even though the sun is getting low in the sky, it was still a balmy 70 degrees. That's pretty magical. 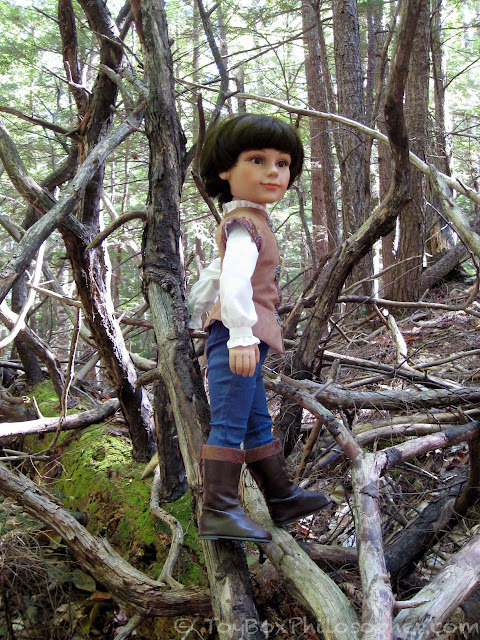 ...and his fancy clothing certainly didn't stop him from checking out all of the little clearings. I wish Stephan could sit down a little better--his legs have to stretch so far apart that he struggles to look natural and comfortable. 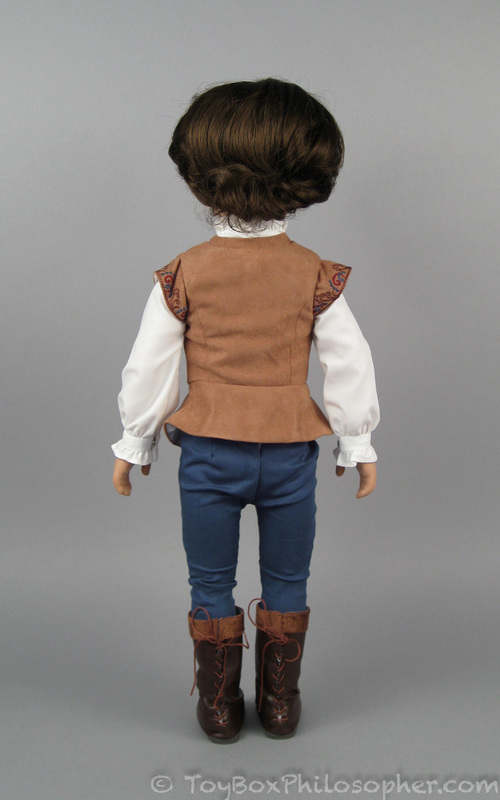 The tight pants don't help, either (that snap comes undone if Stephan even thinks about sitting...). ...he said he was just searching out a nice place to bring Erin, but I know he also loved the element of excitement in being up so high. The two of them explored the area together, enjoying the bursts of fall color in the leaves. Bottom line? 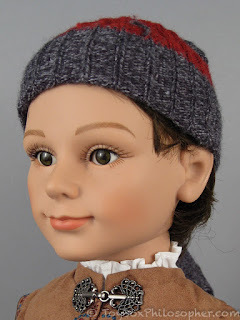 My hat is off to the Carpatina company for making such a wonderful new boy doll for their collection. While I never would have been tempted by the adult-faced Adam and Carter, I find Stephan's happy, youthful face a nice match for my Erin doll. 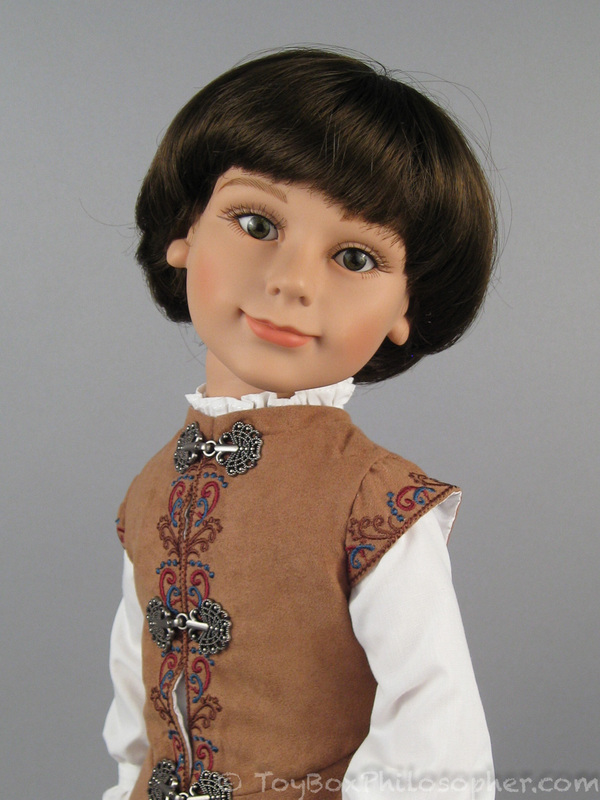 I also think Stephan would make a perfect friend for other slim-bodied 18-inch dolls with more natural features--like the Kidz 'n' Cats girls, A Girl For All Time characters, or even a My Salon Doll. 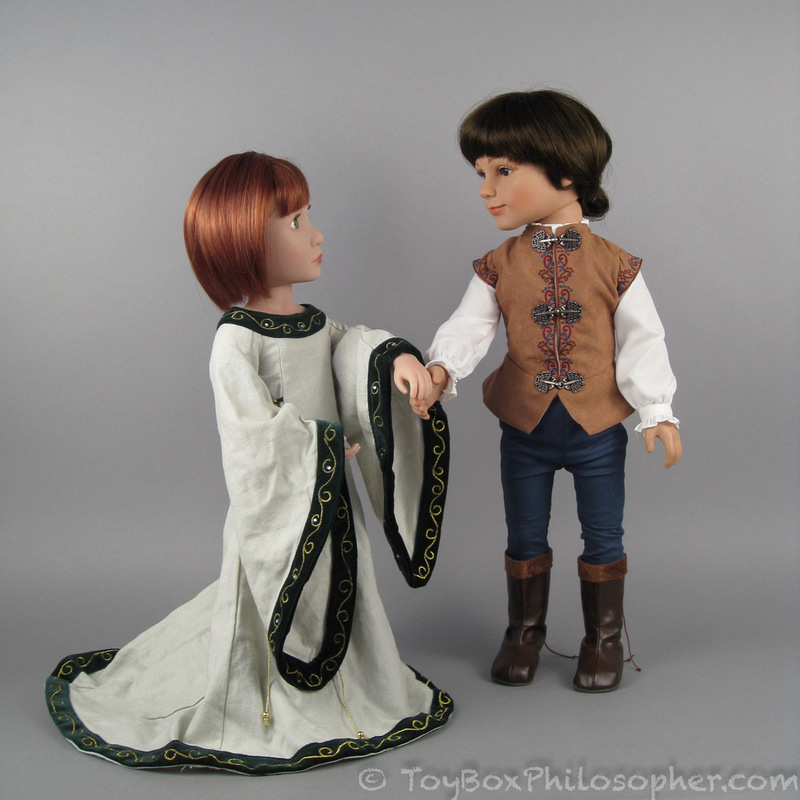 Stephan's medieval outfit is wonderful. 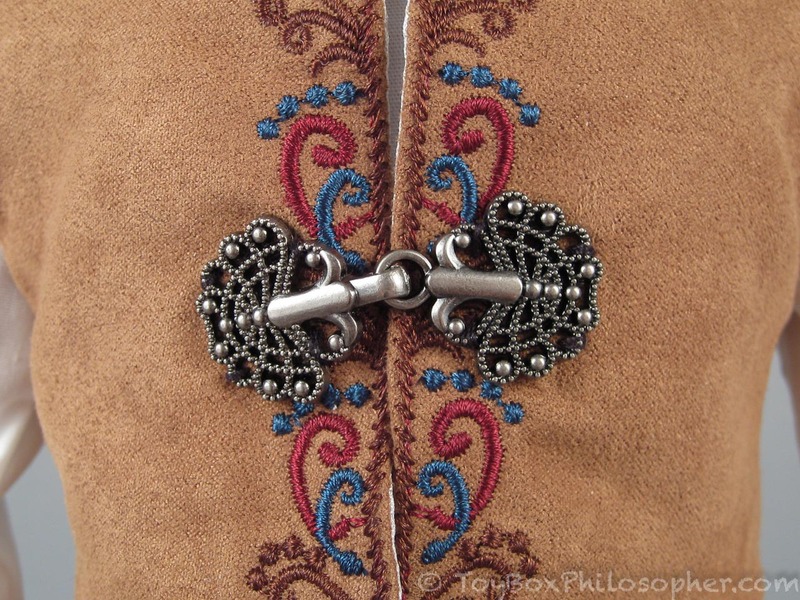 I especially love the embroidered doublet with its elaborate metal hooks and great tailoring. 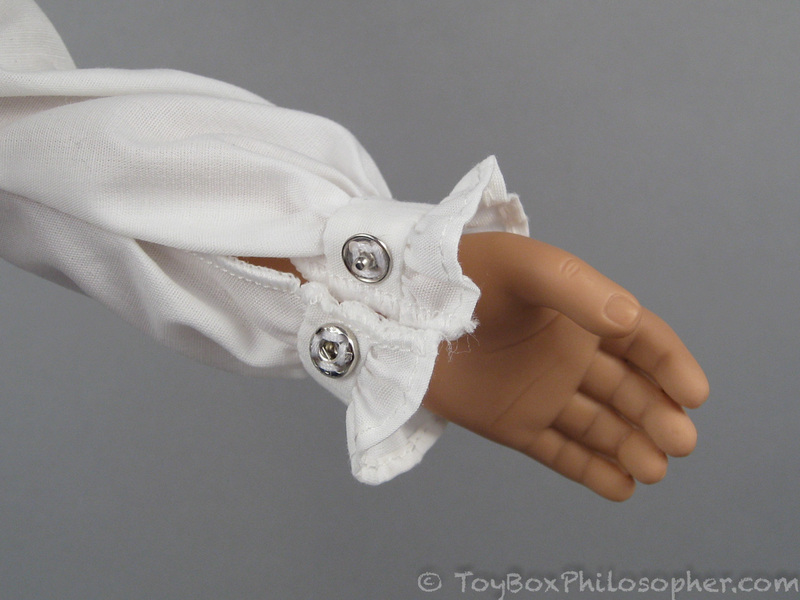 The shirt is also extremely well-made and flattering. The pants restrict Stephan's movement a little and can be tricky to get on and off, but they also look great. 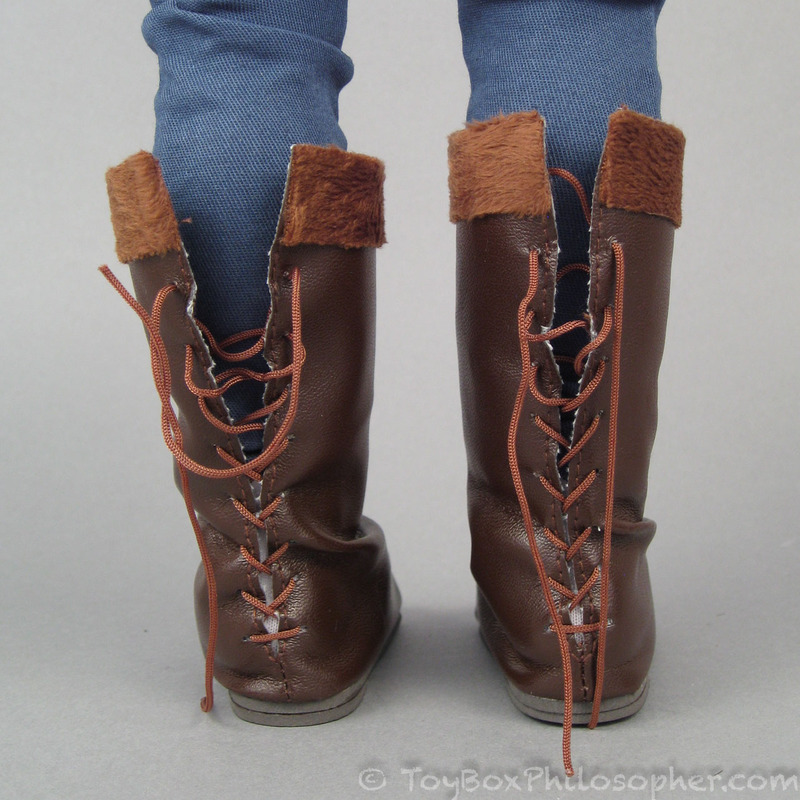 The only part of the outfit that I don't like are the boots, and only because of those infernal laces. 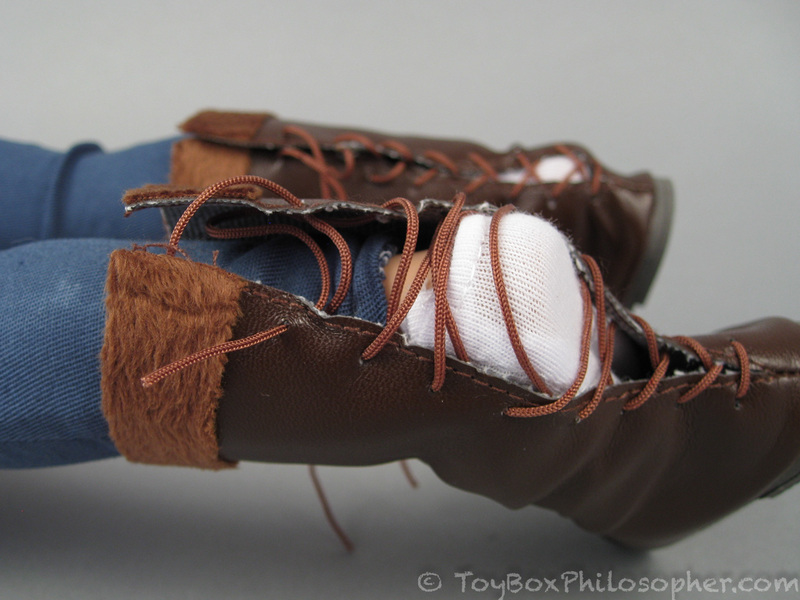 While real laces look nice and add authenticity to the shoes, they are a pain to deal with. 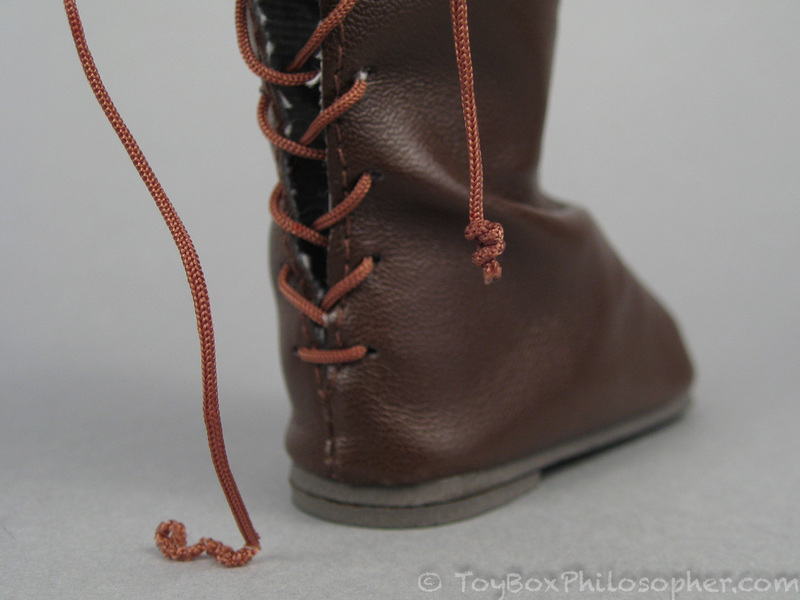 I highly recommend putting small knots at the ends of Stephan's boot laces because without them, the laces could very easily pull right through their holes...and be nearly impossible to get back in place. Even with the knots in place, the boots still gave me grief in the woods because they were constantly coming untied. 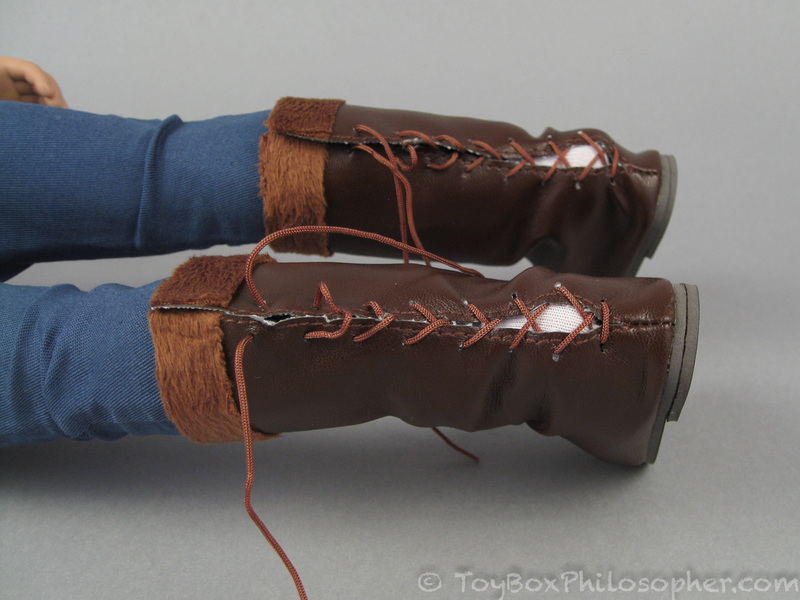 I think the boots would have looked just as good--if not better--with decorative laces or no laces at all. Stephan's elastic-strung vinyl body is very similar to the female Carpatina body. He has excellent balance, decent articulation and he can hold poses well. His head articulation is especially good. 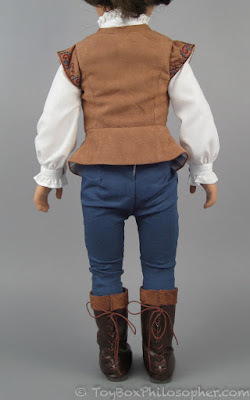 I find Stephan's leg movement the most limiting, in part because there's no knee articulation, but also because the construction of the hip joint makes it so that Stephan can only sit with his legs spread out to almost 180 degrees. This is not a problem with my Carpatina Erin doll. I really like Stephan's face. It's not easy to make a smiling face that looks natural and pleasant, and I think Carpatina has done this very successfully with Stephan. Unlike Adam and Carter, Stephan has features that are well-suited to a boy or a teenager--a look that coordinates nicely with the Carpatina girls. 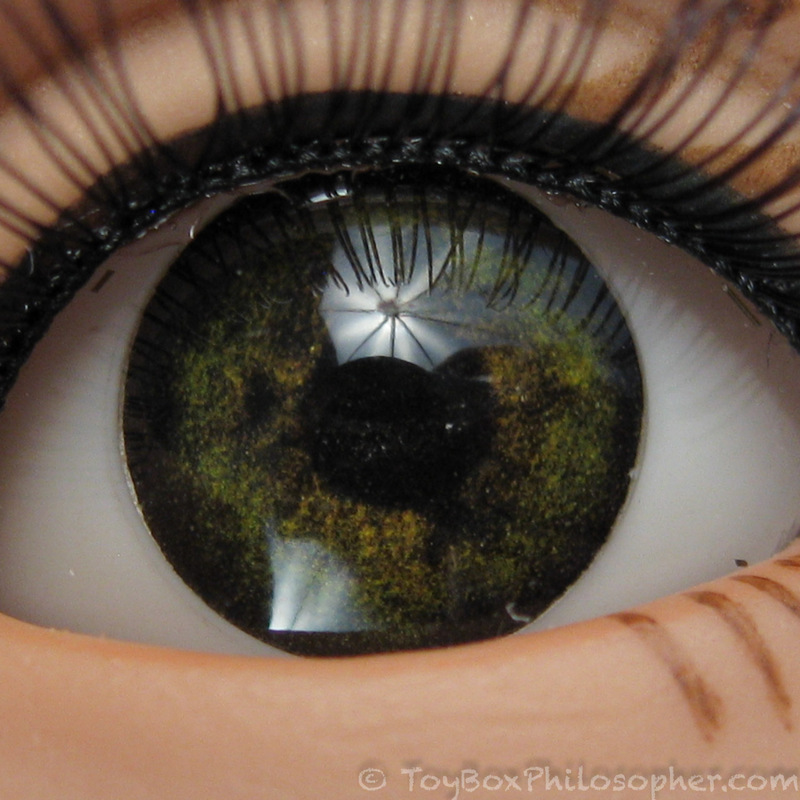 Stephan also has very realistic, detailed green eyes that add to his personality. 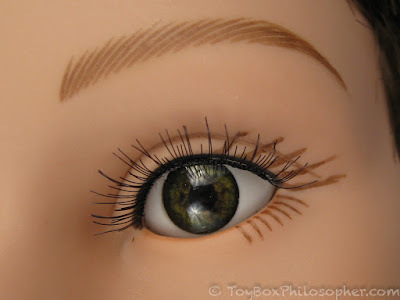 His long applied eyelashes look great, but I'm not as fond of the painted lashes underneath. Stephan's wig is thick and shiny and easy to maintain. 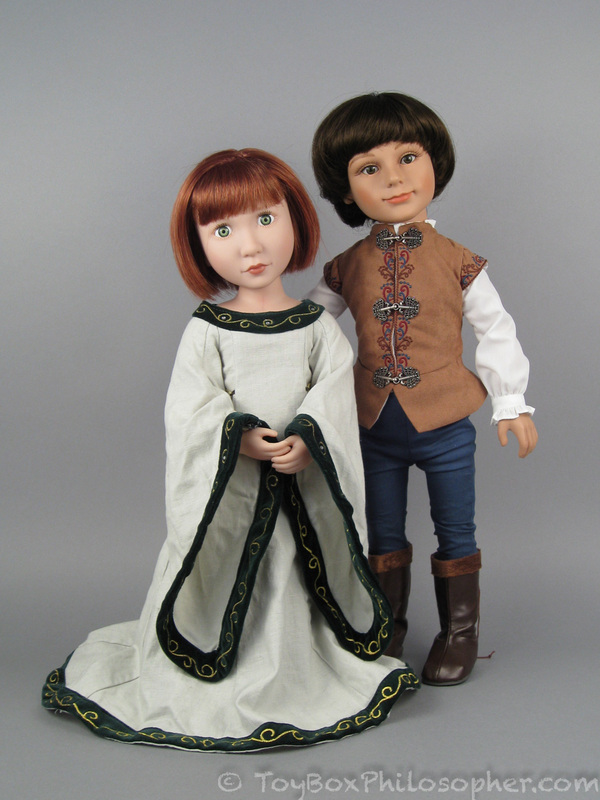 The style is appropriate for a medieval prince (maybe a little too long in back...), but it might not suit kids and collectors who want to use this doll for more modern games or displays. 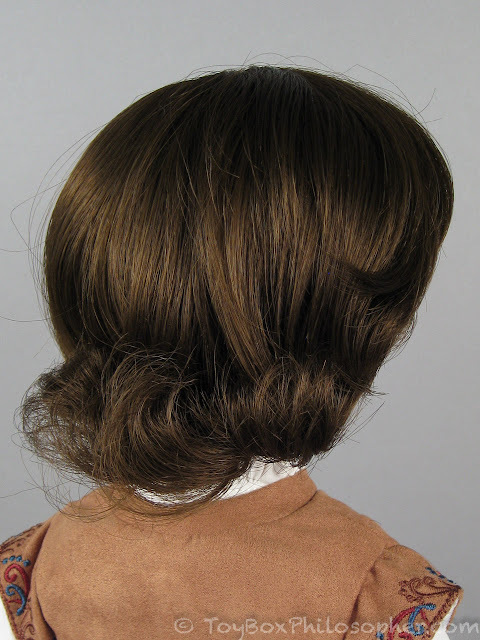 The wig has enough hair on it, however, that it would be possible for a skilled person to trim it into a more contemporary style. 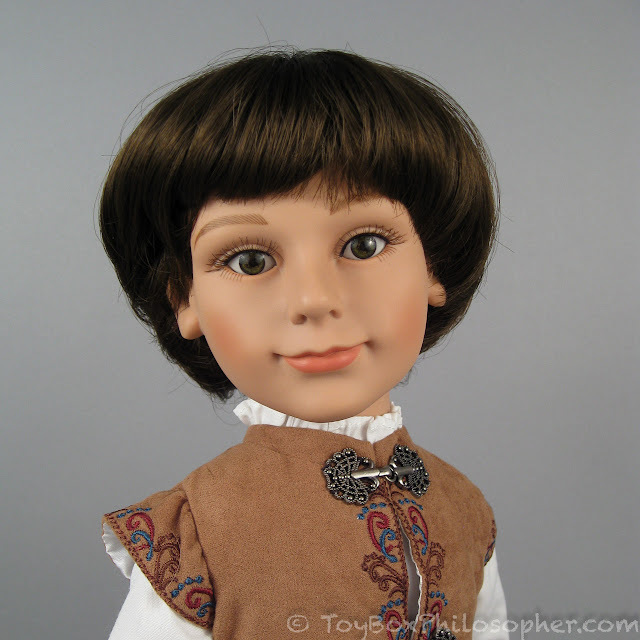 I am not skilled at cutting doll hair, but I enjoy Stephan's pageboy bob the way it is. 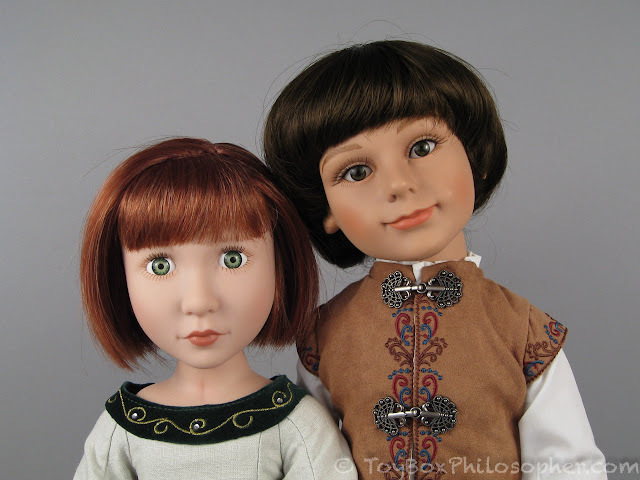 I don't think that the strange-looking Adam and Carter dolls fit into the magical, historical world of the Carpatina characters. 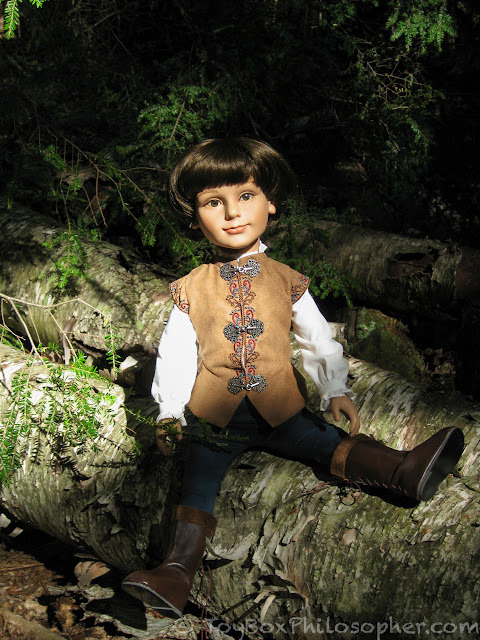 In contrast, the endearing Prince Stephan not only fits in, but adds a rich dimension to the Fantasy Adventures lineup. 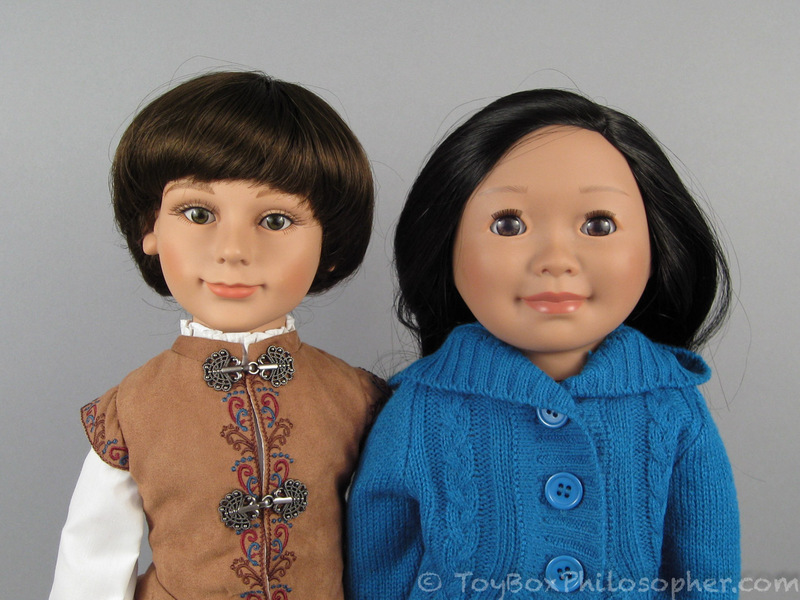 I love that my 18-inch dolls now have a boy companion. Not necessarily a boyfriend (although I suppose he could be) but just a good friend who happens to be a boy. 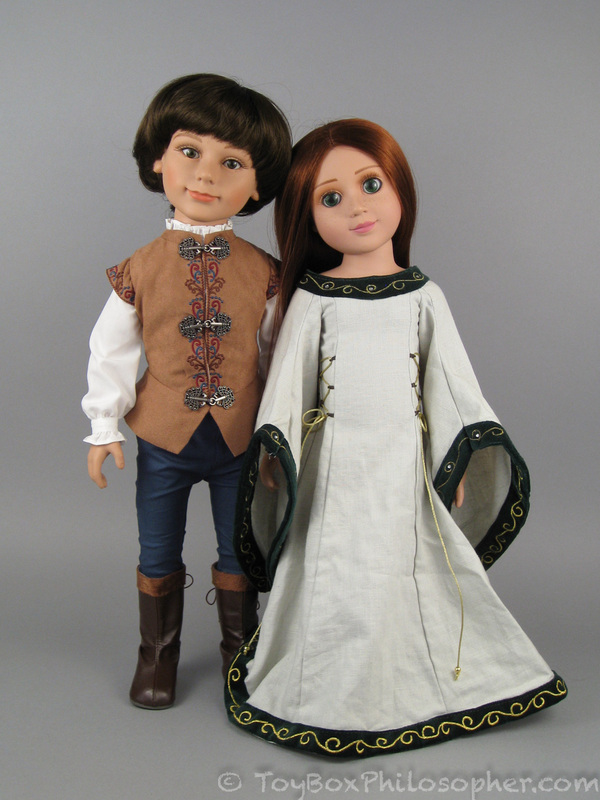 This dynamic is hard to re-enact in the 18-inch doll world, but I think it's an important one. Sometimes when I'm buying yet another 18-inch girl doll, I find myself wondering, what new thing is this doll going to bring to my collection? And it's often hard to find a new quality or feature that makes the newcomer special. But when Stephan arrived, I had no such feelings. He really does bring a surprisingly fresh perspective to the way I interact with my dolls. Prince Stephan has filled a hole in my collection that I never even realized was there. In order to get a full idea of the storyline behind these dolls one has to have one of Carpatina's catalogs, and one also must pay attention to the descriptions of each product on the website. Some of the historical outfits have cute stories attached to them. The catalog explains the reasoning for the moonstones, and the reason why most of the characters are connected. Rowena, for some weird reason, has no tie-in to the storyline. Great review, as usual. I was hoping desperately that someone would review this handsome young prince! I love reading the descriptions for the outfits. 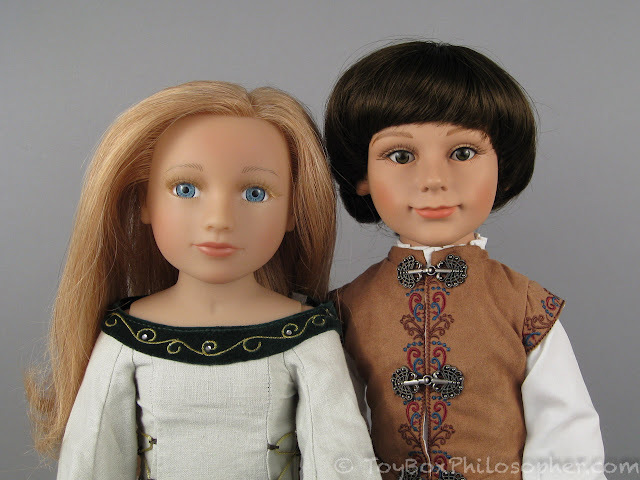 I have the three original dolls; Isabella focused more on faries/fantasy, Julia was Middle Ages/Renaissance with an emphasis on adventure, and Emma was geared more towards actual historical characters and nobility. Rowena came out shortly afte the movie Brave, so I think of her more as an homage to that than an actual moonstone character. 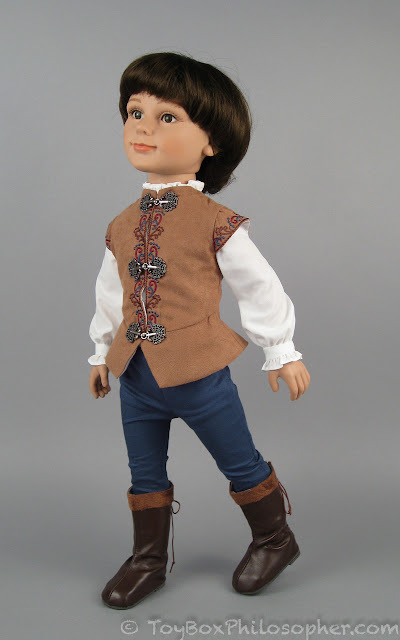 I have one of the Just Pretend 18-inch slim dolls customized as a historical boy to go with them, but I'm hoping to eventually get Stephan as well. Great review, as always! 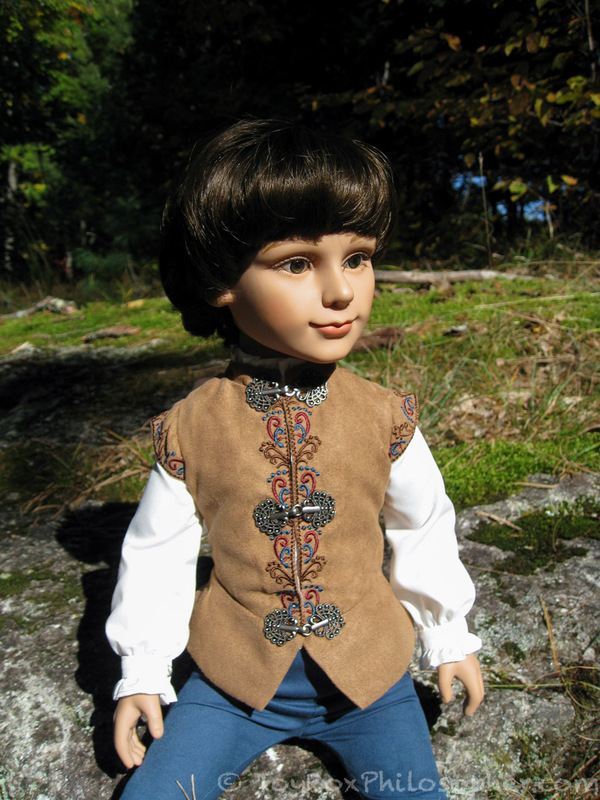 I'd love to see how he looks paired with Saila- she seems to me to have a good balance between doll like and realistic, and could fit in well with Stephan! Hi Rose, that's a good idea! Saila is also very realistic. I wonder if she'll be larger than Stephan, though....I can't picture it in my head. I will try to do this comparison later today. Thank you for the suggestion! Gosh, what were they thinking with Adam and Carter? I can't imagine that anyone would really be tempted to buy them (except as a really expensive gag gift, lol.) Stephen is cute. I think he really does look perfect with Erin and especially love the photos of them in front of the trees. 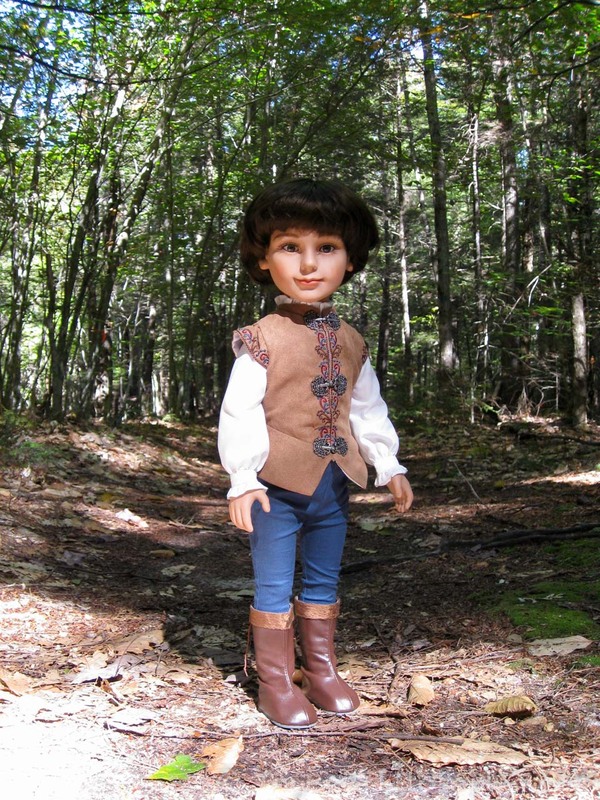 He sort of reminds me of "Robin Arryn" from Game of Thrones! Haha, I know, his character is awful, lol sorry! Thank you, Aileen! :D I agree about the sock. 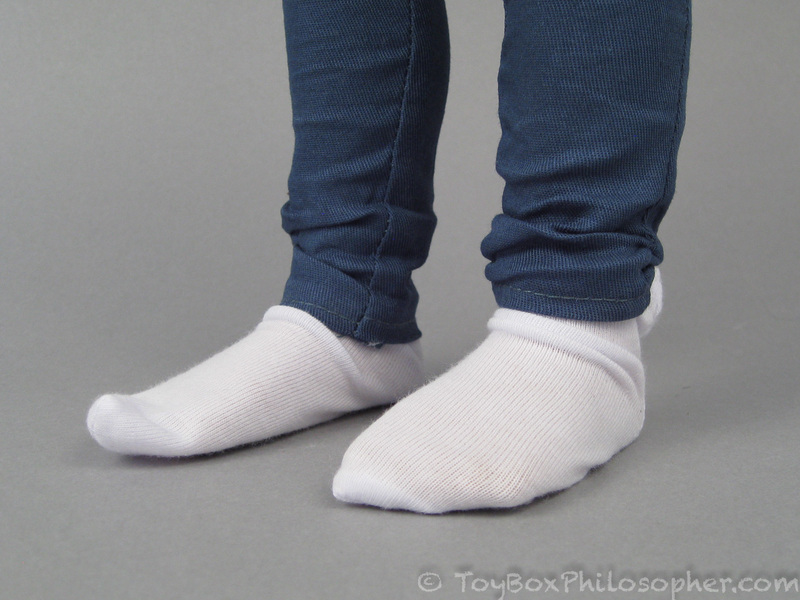 I think it was Stephan wearing that sock that actually reminded me very strongly of someone I know around here. 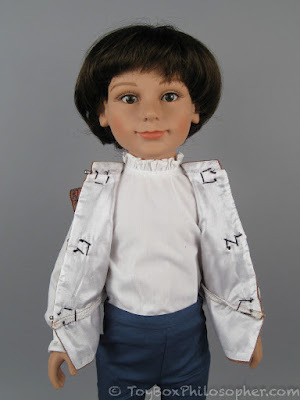 I'd love to see this doll redressed in some more modern clothes because I suspect he could pull off that look, too. He's a cutie. 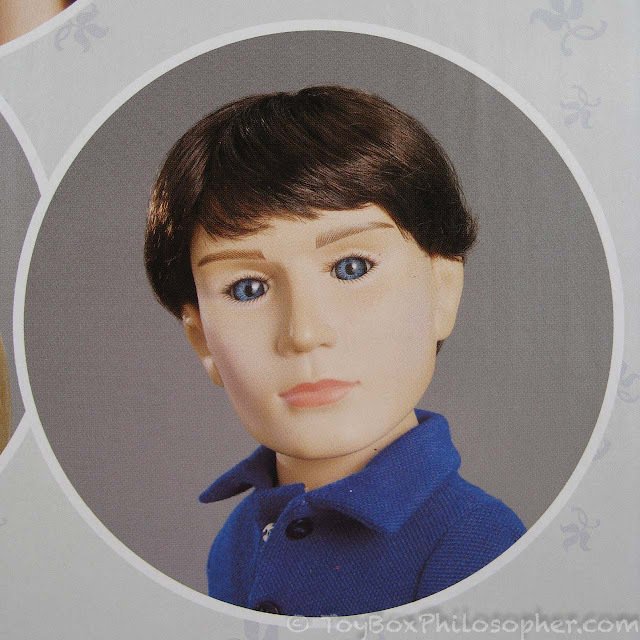 My problem with Carter and Adam is that their iris is ridiculously large - it covers like 95% of their eye and makes them look so unnatural and alien! 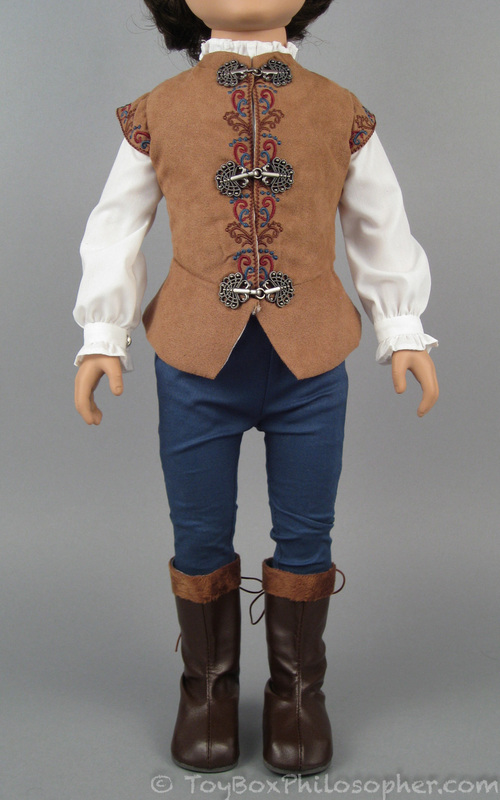 Stephan's by contrast is smaller and of a much more realistic proportion. That's a really interesting observation, Esther! Wow. I never thought to trace some of the alien-like quality back to the eyes. You're absolutely right that there's practically no white in the eyes! I always figured it was just the large, adult-like head. I also agree that Stephan's eyes are just right--size, color, everything is very nice. Thank you for pointing this out!! 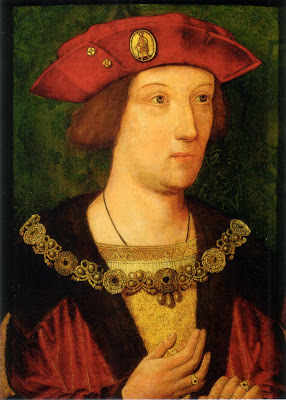 Thank you for posing Prince Stephen with your Clementine. 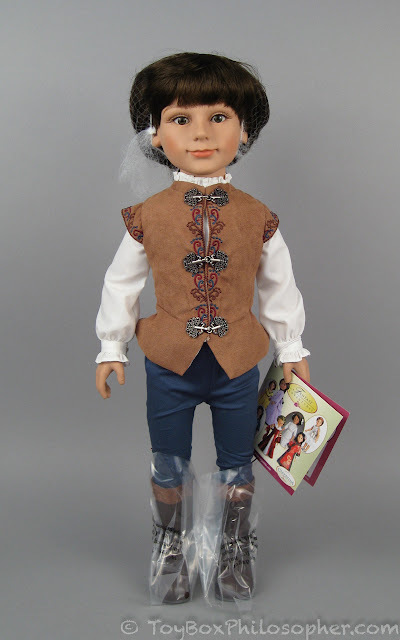 I have been thinking about buying him for my Matilda. I wish his articulation were better, but he would be nice to pose standing with a girl doll just standing. He needs a little sword! Emily, did you see the new Lammily doll? I do not really like it, but I like how they are making more. Maybe you can give it a look? I have seen her, yes! I actually have her on pre-order so that I can take a closer look. I think she's promising, but I wonder why she's posed with her hair out to one side? Maybe the windswept look? Hm. 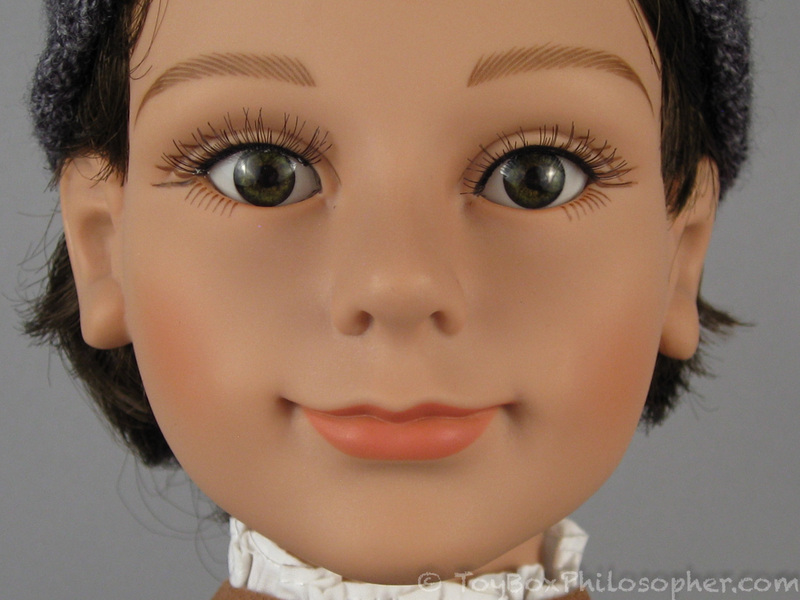 I'm very anxious to see the real doll! So am I! I cannot wait to see the review! I have a Makie doll that was posed online like that(hair to side), and it turned out her hair was in a ponytail! 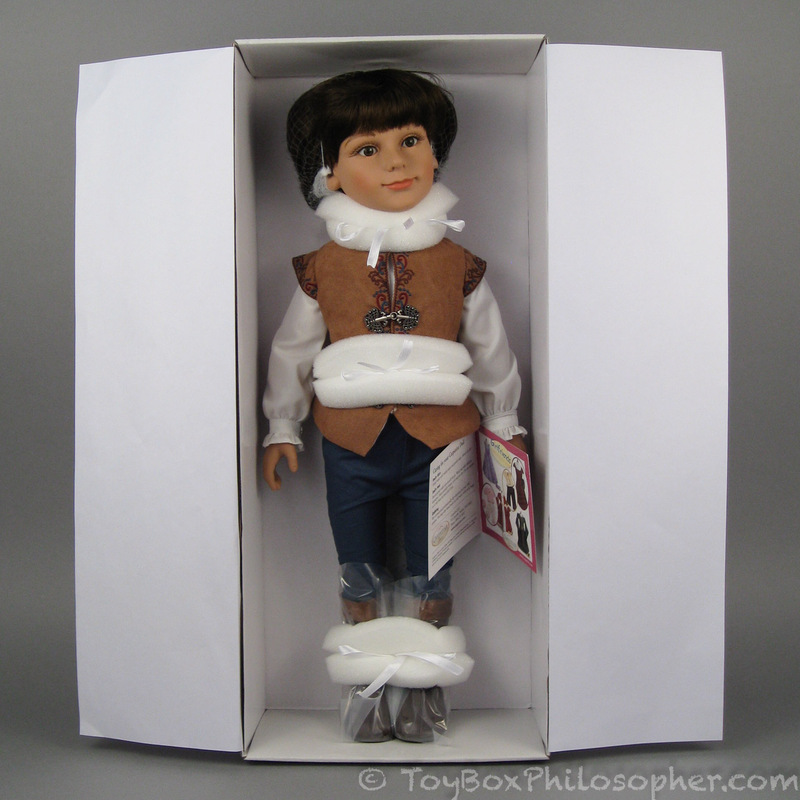 Maybe it is the same with this doll? 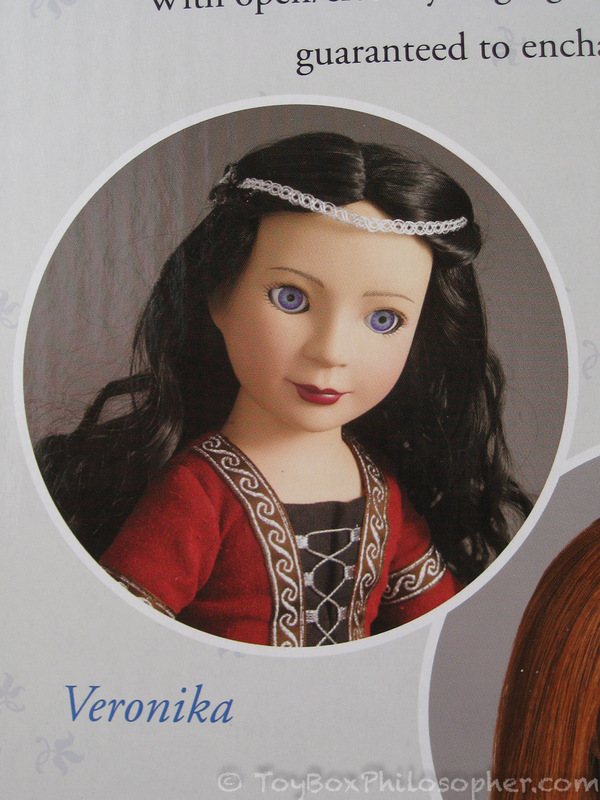 I am looking forward to further varieties I am sure Lammily will make after this new doll. Maybe they will make a blonde to compete with Barbie? Excellent review as always! Thanks for your insight. Maybe Carpatina will hear you and add some velcro to the boots. 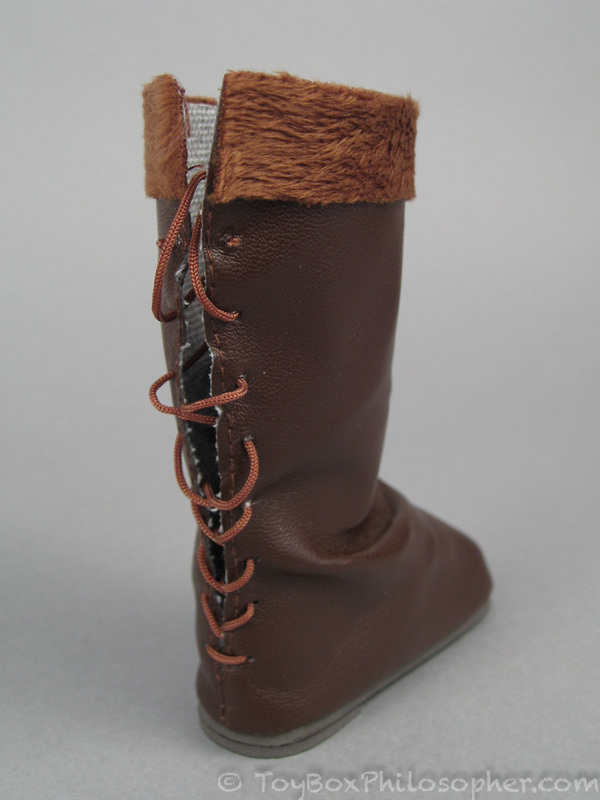 No need to remove the lacing which is nice but adding some velcro on the inner side of each boots might play the trick. By the way your excellent review helped me make the decision to purchase my Las Reinas dolls. I'd like to see Stephan in a more modern, shorter wig, so that he would look more like a contemporary young man. 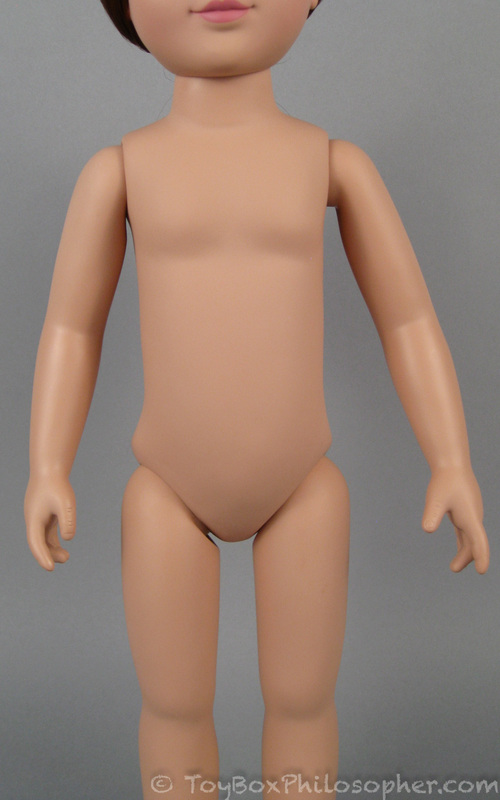 Any idea if the wig is easily removable, and where I might boy-doll wigs? 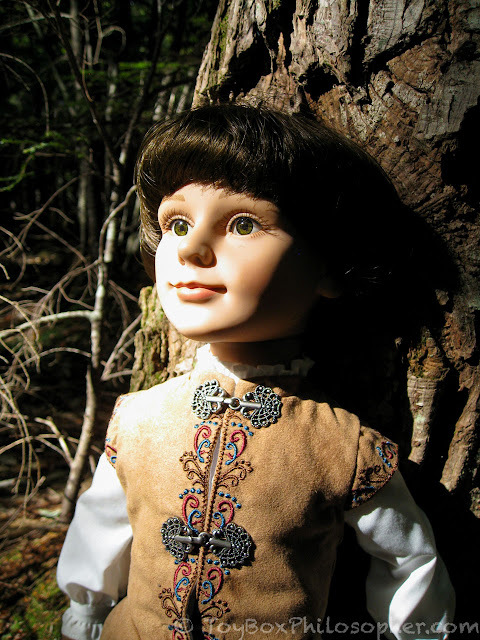 I'd been wondering about this doll, so it's great to see an in-depth look at him! I'm still not 100% sold on his face, but I love the outfit they've given him (even if those boots could have been a bit more user-friendly), so that may be enough for me. 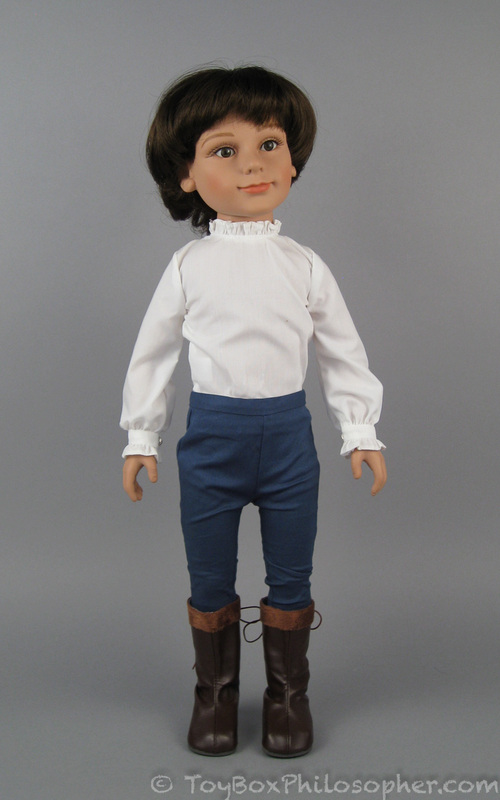 And he's certainly a step above their old boy dolls! 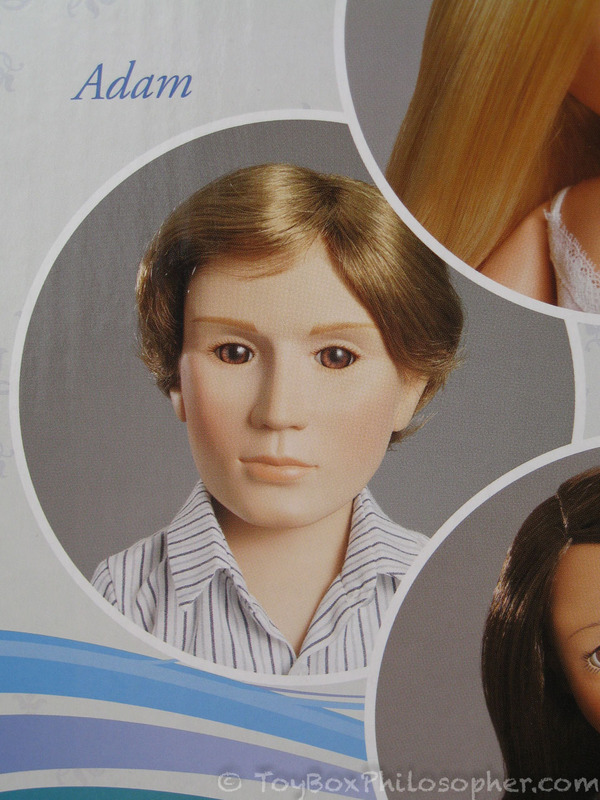 He might just be the most realistic playline 18" doll I've seen. I just love his face, including the very natural shape and size of his eyes. 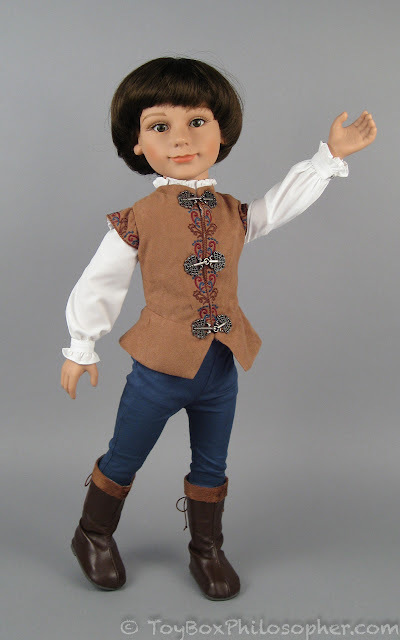 There's also no reason that he couldn't be a female doll. 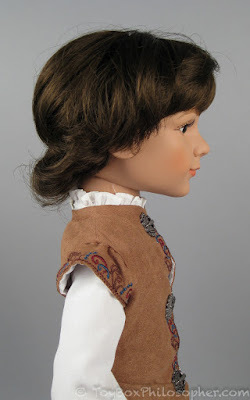 His face, to me, seems like a older child's face (say 8-10 years old), so it could just as easily be a girl's face, maybe with a rewigging, for people who need their girl dolls to have long hair. 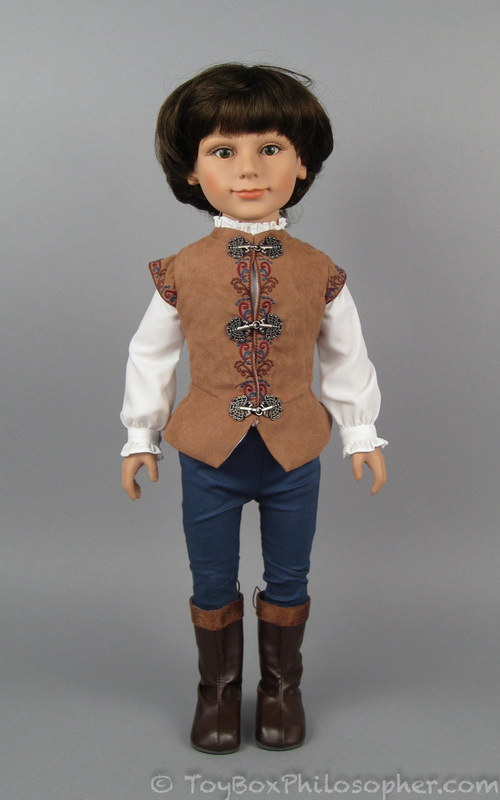 I love him so much that he might just end up my first 18" doll. Thank you! 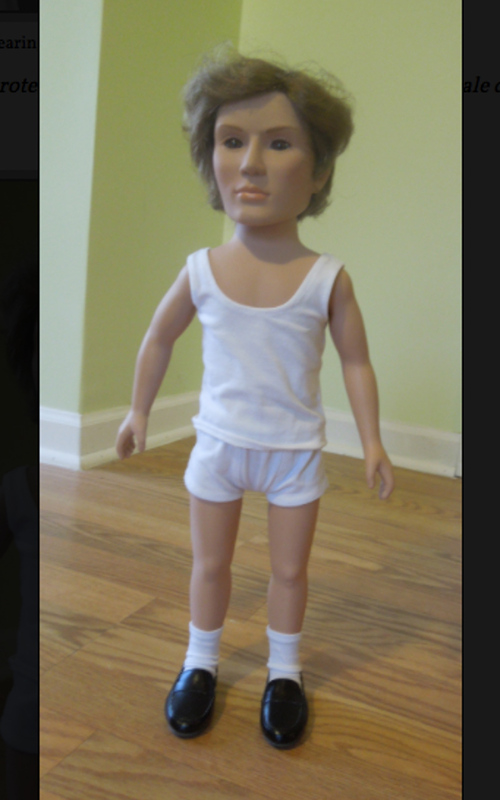 I wonder why he is so different form the other boy dolls, though! Maybe they figured out that their older boy dolls were not working? I think he's wonderful. The impish face lends itself to many imaginative options. What unnerves me a bit is that he reminds me of a relative of mine. I don't like when I see resemblances with those I know...not quite sure why, ....in any case I can see him in all sorts of outfits. 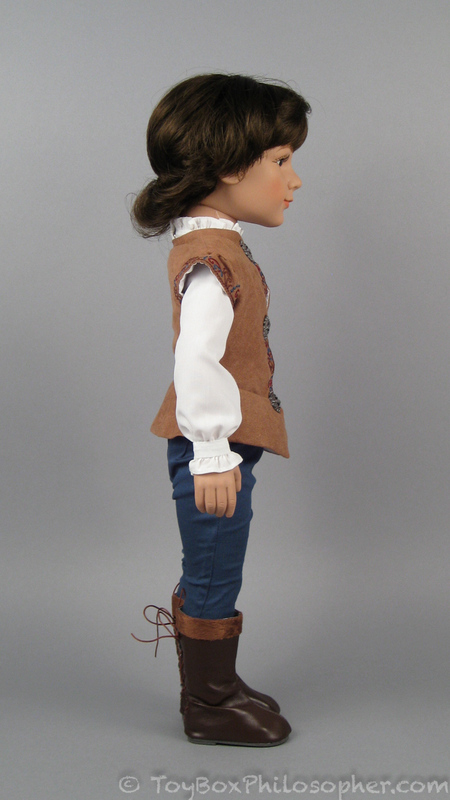 A blond wig, as Oliver Twist, or Christopher Robin., the prince in the prince and the pauper. 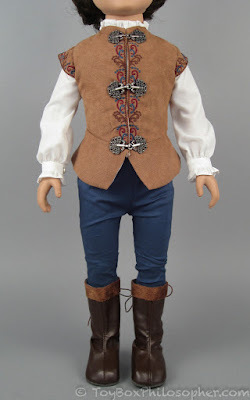 A male doll like this has been really lacking. I think he will be immensely popular. 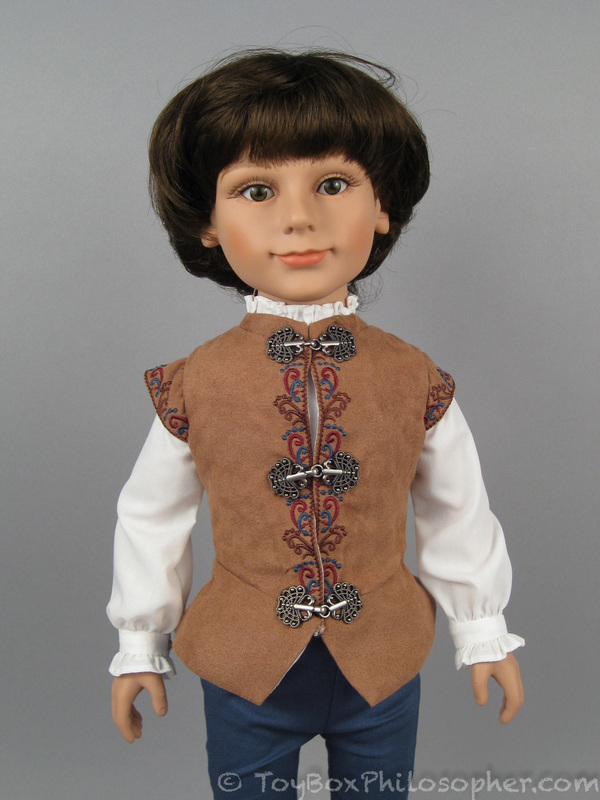 I also don't necessarily think I would feel the need to give him a female doll companion. He has enough character to take center stage..If I had my druthers the legs would have been longer. Still if I can get over the uncanniness of the family resemblance I will add him to my collection. 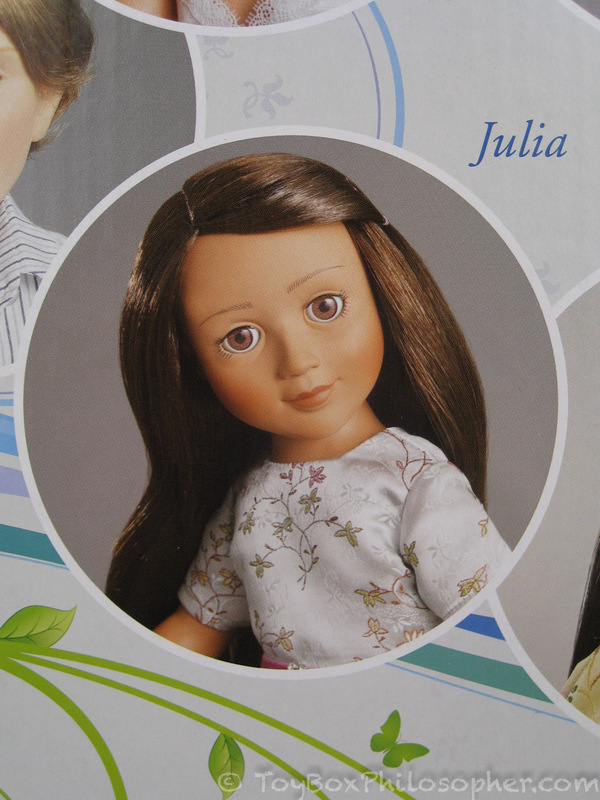 As for their other dolls, I find Julia really appealing. Don't recall reading what the price was for him but I assume it will be comparable to the price of their other dolls,... although I agree his sculpt is superior to those of the girls in the line..As for the other males they offer...in short, shudder. I love his cute, dainty hair style. And his smile is so mischievous! 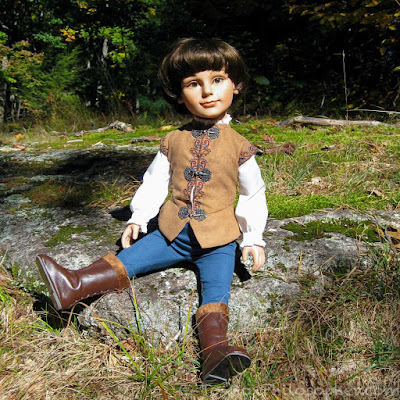 :) I think that facially, he resembles your Karito kid Ling. I don't know if that's right though, since I have a bit of difficulty differentiating/categorizing traits of faces, due to likely having very mild face blindness. But I think the eyes and the mouths seem a bit similar. It'd be cool to see a side by side. Thank you for a fun and thorough review. 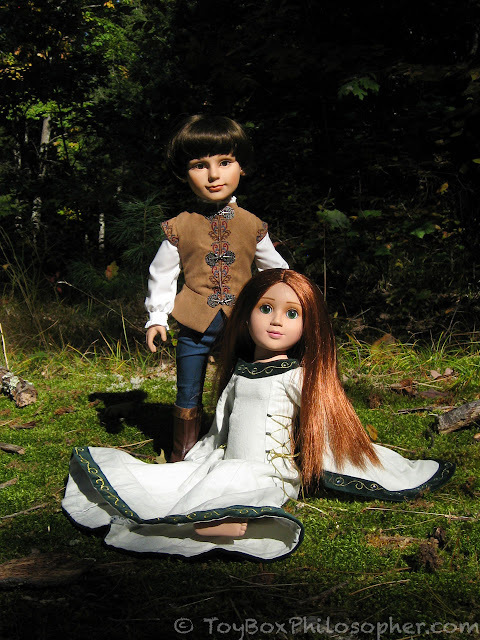 It would be nice to see a clothes-sharing attempt with, say, Our Generation, American Girl, Maplelea, etc., since these and other modern-setting doll lines have clothes that could be unisex. Your complaints about his tight pants, for instance, make me wonder if the looser jeans that an American Girl doll might have would be more effective. 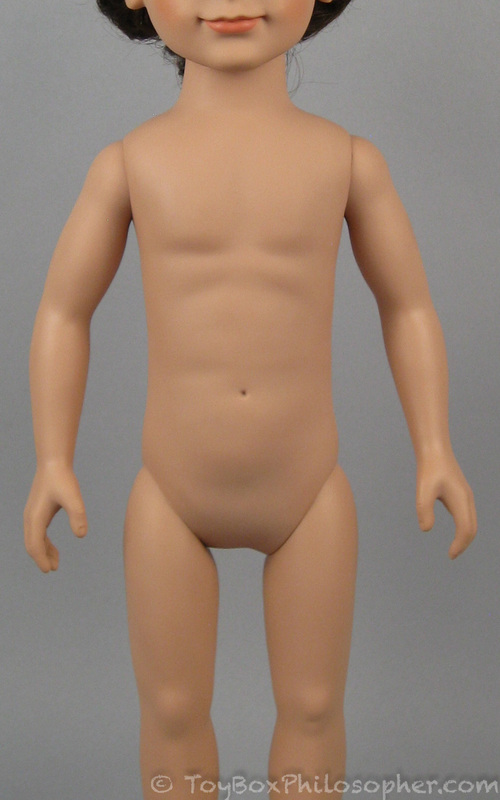 Did any of your other 18" dolls come wearing pants? ...I also kept expecting to see Adam photoshopped in at horrifying and unexpected turns throughout this review. Your reviews are always a pleasure to read, Emily! 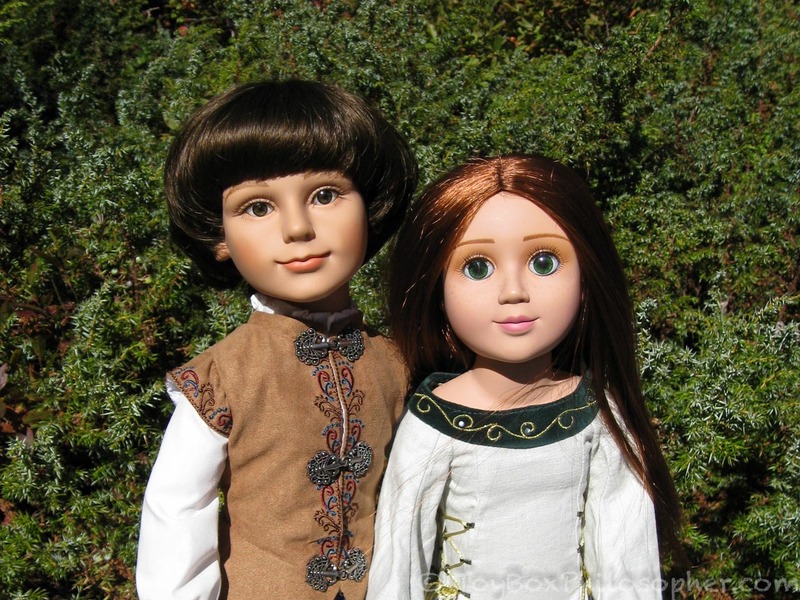 This review and the comments made me very curious about the backstory of these dolls. From what I could find online, originally there were three dolls in the line - Julia (brunette), Isabella (blond) and Emma (redhead). 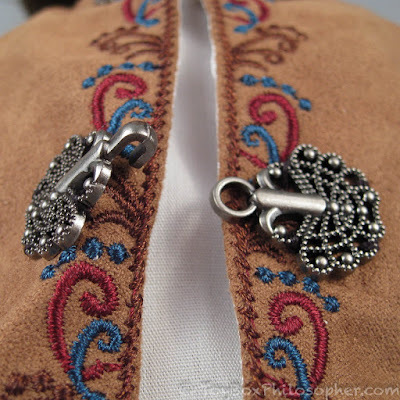 To make the connection between these dolls and the detailed outfits from different time periods and places, the idea about a magical moonstone pendant is introduced. "The gem, along with a deep and true wish, is enough to transport the wearer to where she longs to be." To me the story is not fully developed yet and not very cohesive. One entry on Carpatina's blog, describes how Julia sees her grandmother Cordelia in the moonstone as if in a mirror. Then in "Julia's Story", we learn that "aunt Cordelia willed both Julia and Isabella, Julia’s cousin, jeweled necklaces". 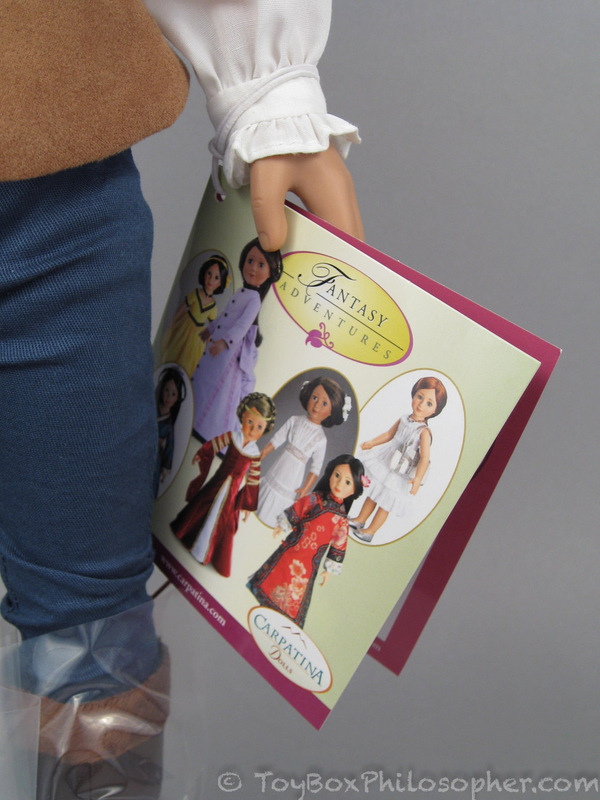 Now Emma and Isabella dolls are retired and many other characters were introduced. A mystery woman Cordelia (who is Julia's great grandmother/great aunt) had a collection of magical moonstones. These moonstones allow the wearer to time travel, impersonate a historical figure (Emma as Lady Guinevere for example), communicate with Cordelia. 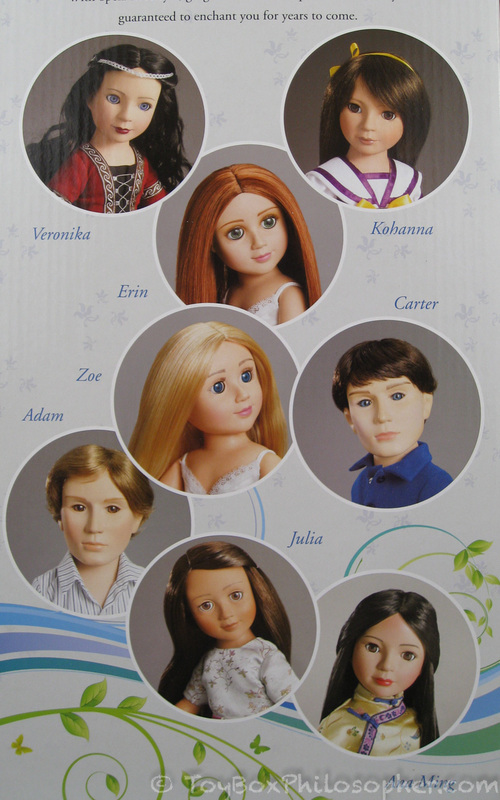 Julia, Emma, Isabella, Ana Ming, Kohanna and Adam are all cousins. Adam is Ana Ming's brother and Carter's friend. 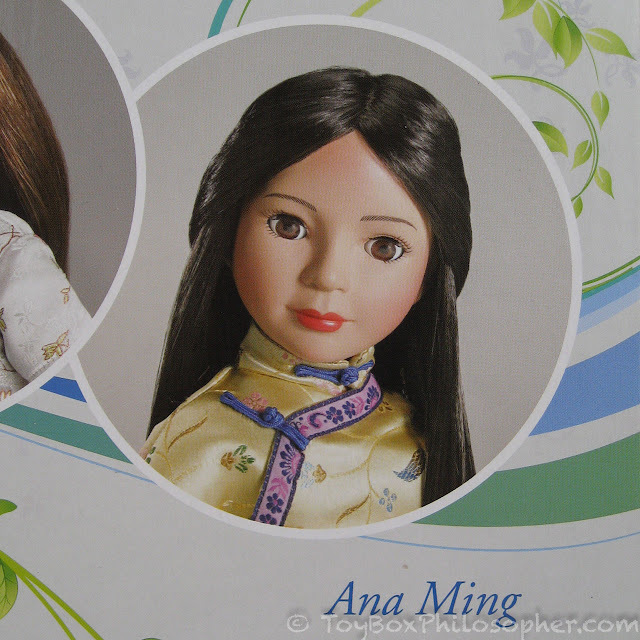 Ana Ming's mother is of Chinese descent. 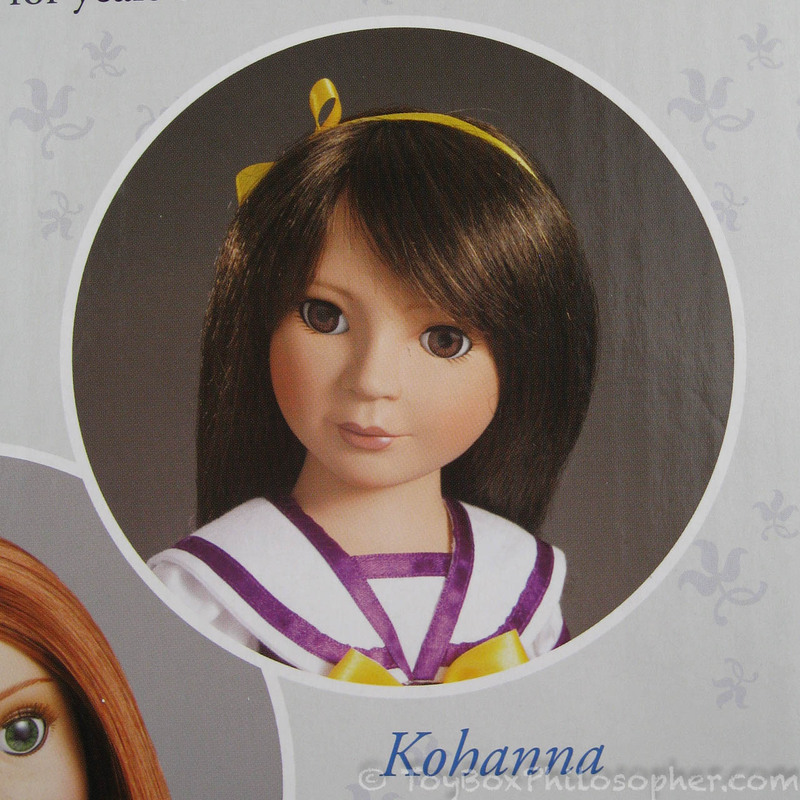 Kohanna is Japanese. 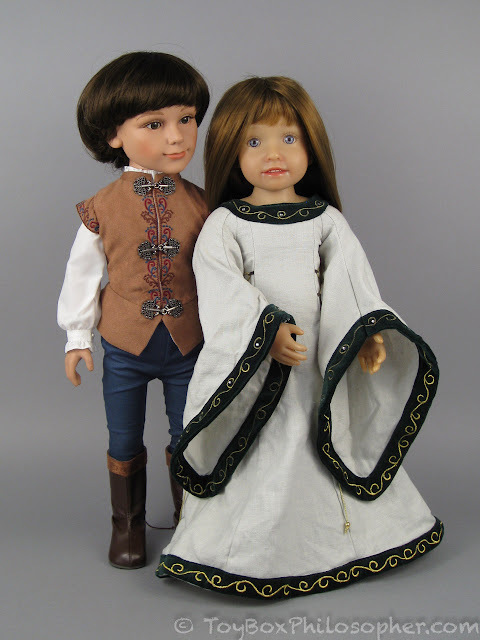 Veronika, Rowena and Prince Stephan are visitors from the past who also use the magical powers of the moonstones. Zoe and Erin are best friends and aspiring fashion designers. 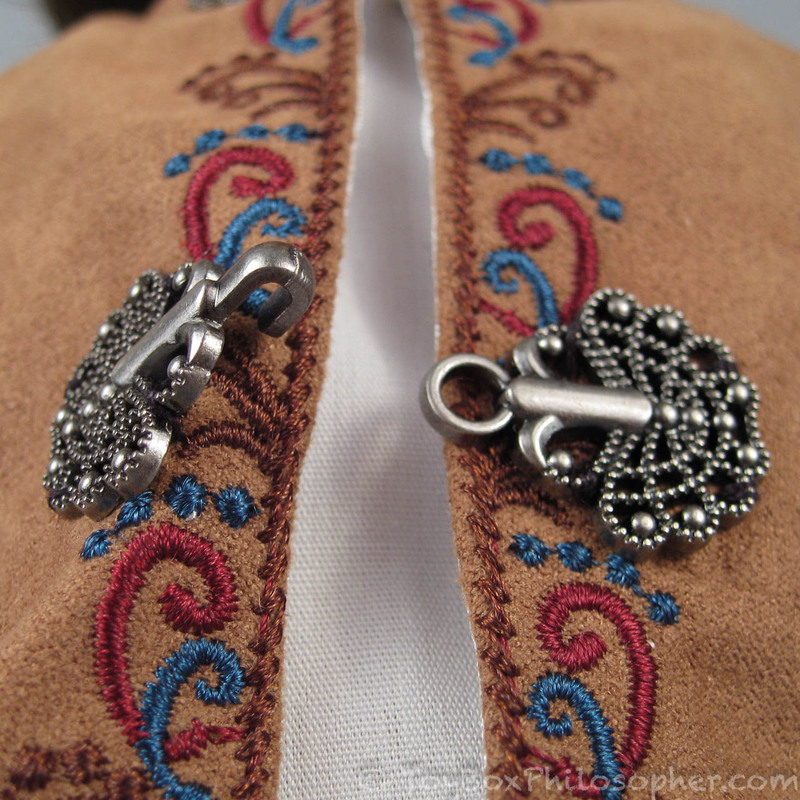 In the back room of a community theater, they find two moonstone necklaces in the pockets of historic garments. Great review! 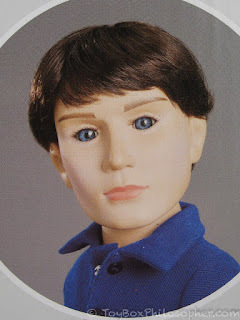 As a collector of boy dolls, I have a few other American Girl-scale male dolls to suggest: My Sibling/My Pal and Rowdie Boys. 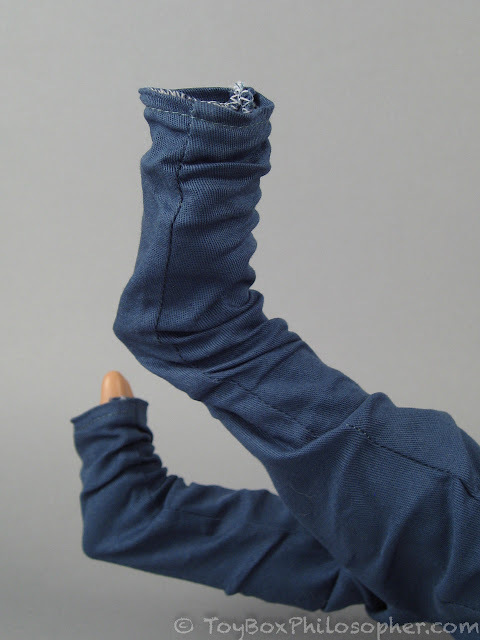 They are pretty inexpensive (My Pal/Sibling is about $48) and aren't as well known because they are primarily marketed to people with disabilities and veterans. But the dolls aren't sculpted any differently from able-bodied non-veteran dolls. 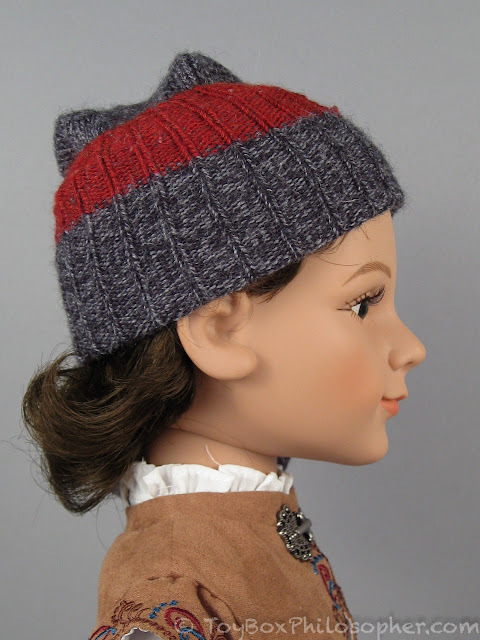 It's more the add-ons, option parts, clothes and accessories that reflect who they're supposed to be. 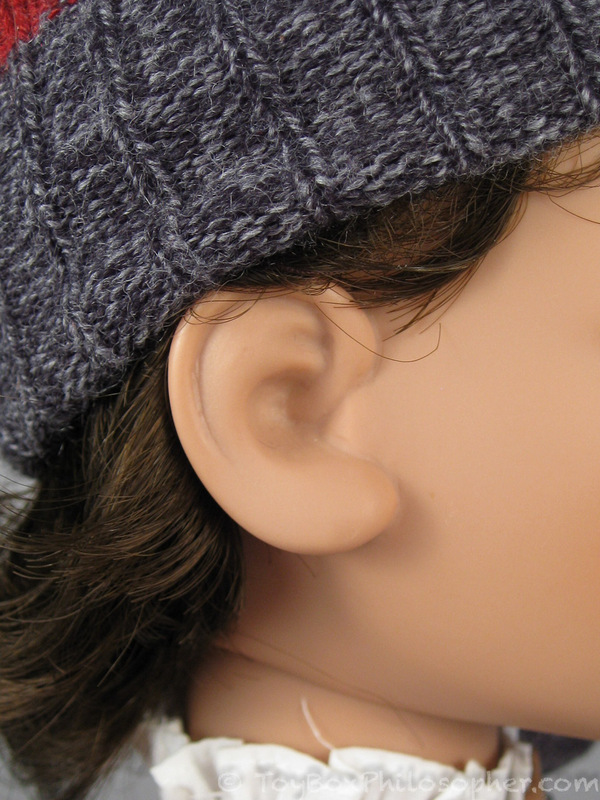 On the site the person uses puzzle pieces to relate to autism, uses person first language as opposed to identity first, and generally is giving off bad signs. As an autistic person, I wouldn't want to give any money to them. I don't think they're really on the side of disabled people. They aren't in tune with the culture. I'd stay far away. Are you planning on doing a review of your SelfieSnaps Cloe? I love her pink hair and freckles, but I'd like to know more about her quality before buying. 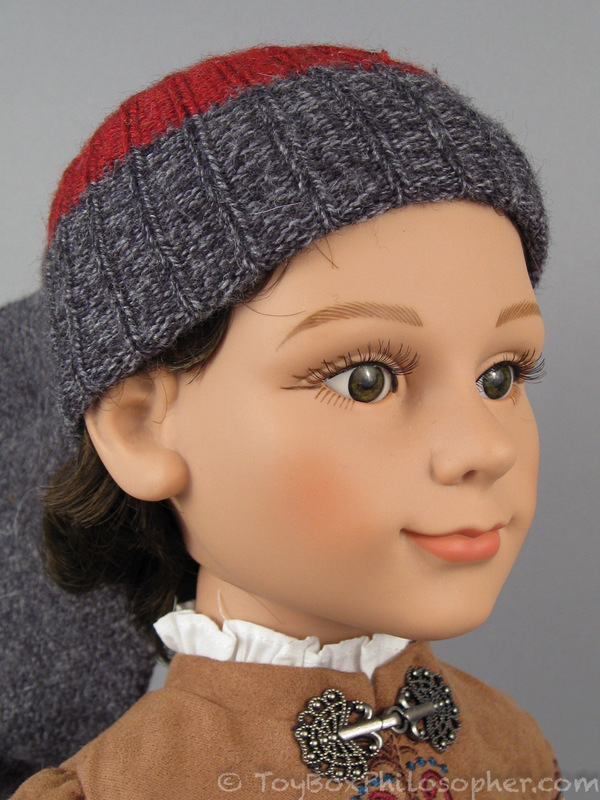 This doll is gorgeous! 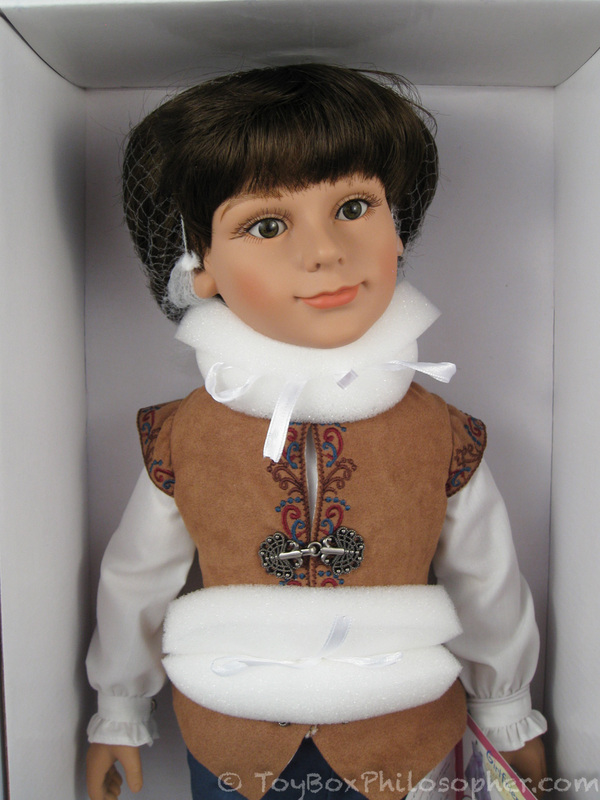 His expression is so sweet and kind, and there's a lot of realism. 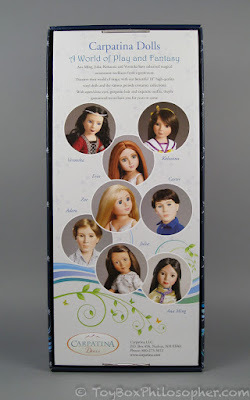 I wish my daughter was into 18"-dolls.